Best Western Inn & Suites est idéalement situé dans le centre de New Braunfels. Venez découvrir et profiter de notre hôtel à côté des principaux sites touristiques. Réservation au meilleur prix et offres exclusives toute l'année. Bienvenue au Best Western Inn & Suites ! 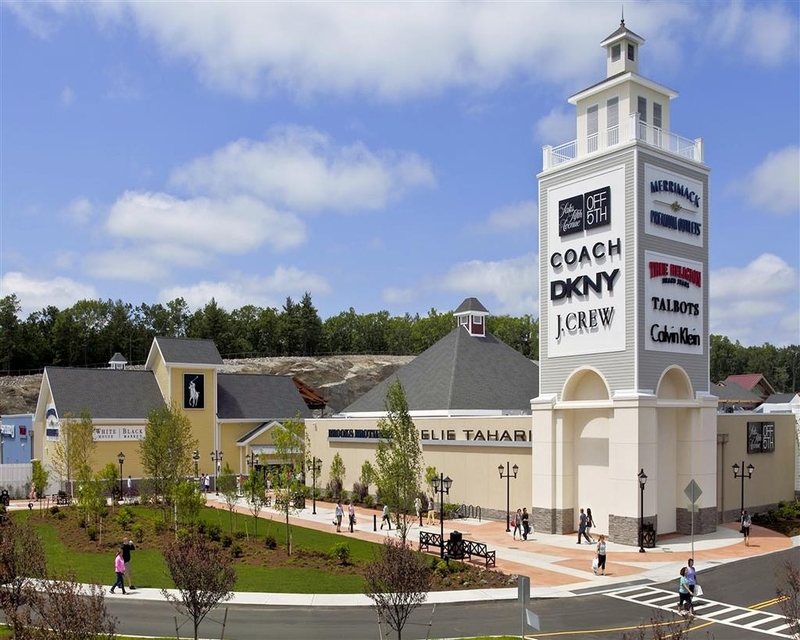 Les magasins d'usine Prime Outlets et Tanger® Outlets sont à quelques minutes seulement de notre hôtel de New Braunfels, et c'est l'une des principales raisons pour laquelle de nombreux citadins viennent séjourner ici. 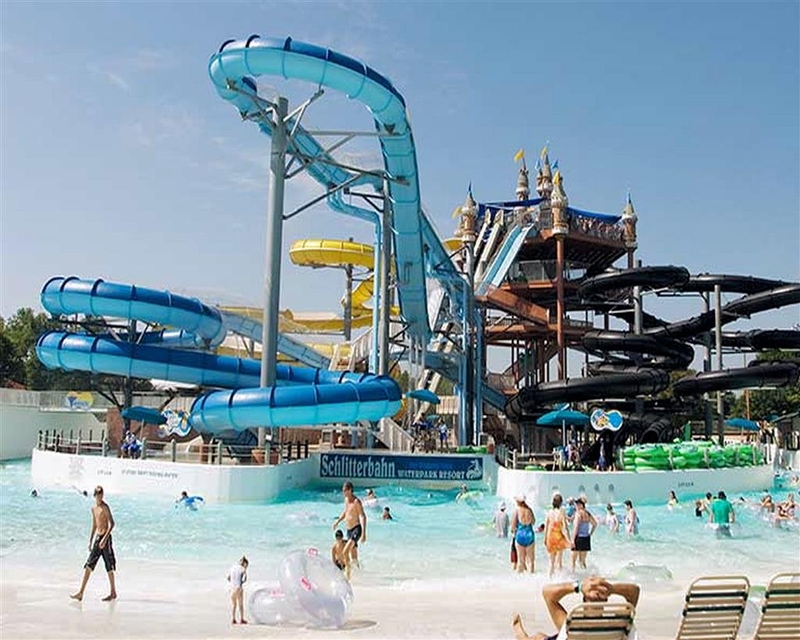 Que vous soyez venu pour vous rafraîchir dans la rivière Guadalupe pendant les mois chauds d'été ou pour explorer les possibilités du parc aquatique de Schlitterbahn, vous serez au frais dans notre hôtel de New Braunfels. Un certain nombre de familles et d'aventuriers en vacances séjournent chez nous et notre personnel amical fait en sorte que le séjour de tous soit aussi agréable que possible. Avec l'accès facile à l'Interstate, les trajets sont courts, que vous partiez pour une réunion d'affaires ou pour une journée d'exploration. Des chambres attenantes sont disponibles pour que les familles et les groupes puissent séjourner ensemble, tout en bénéficiant d'une certaine intimité. Notre hôtel entièrement rénové est propre, confortable et conçu pour répondre aux besoins des clients. Bénéficiez d'un petit déjeuner chaud complet et gratuit dans notre hôtel de New Braunfels, composé de gaufres chaudes, pâtisseries et céréales, choix de yaourts et fruits frais. Complétez le repas avec des tasses de notre célèbre café 100 % Arabica ou de vos jus de fruits préférés. Chaque matin devrait débuter avec un petit déjeuner copieux et savoureux, afin que vous puissiez avoir toute l'énergie dont vous avez besoin pour profiter de la journée, et c'est exactement ce que nous vous proposons. Le golf est l'une des principales activités de cette région. Quant au tubing, c'est un véritable mode de vie. En séjournant dans notre hôtel de New Braunfels, vous ne serez qu'à quelques minutes en voiture de la rivière Comal, un endroit idéal pour passer l'été. Toutefois, les voyageurs d'affaires travaillant avec Resolute Health, l'hôpital Christus Santa Rosa et Team Industriale, ainsi que les équipes de construction, apprécient également de séjourner chez nous. Nous prenons soin de tous les voyageurs, que vous soyez venu pour montrer votre habileté au tubing ou pour travailler un peu. Réservez votre prochaine chambre au Best Western Inn & Suites, où le rapport qualité-prix, l'emplacement et le service sont excellents !Passez un excellent séjour ! "sofest beds .. so comfy"
sofest beds .. so comfy... not the most upper class palce but all the comforts of home ... except the hot breakfasts... eggs seem like their reconstituted freeze dried eggs and the sausage i have no words for at all ... but all else is so good... the agents at the counter are the BOMB.. kind.. thoughtful and so friendly..
Great experience. Hotel was very clean, comfortable, and well maintained. Staff was very helpful and knowledgeable about the area. Breakfast was good, and well stocked. Beds were great and everything worked. Will stay here in the future. The motel was clean and comfortable, the people very friendly. The breakfast was a bit more than I had expected. The buffet included hot sausage hash browns and scrambled eggs and was actually quite good. All three members of the staff that I encountered were friendly and very polite. 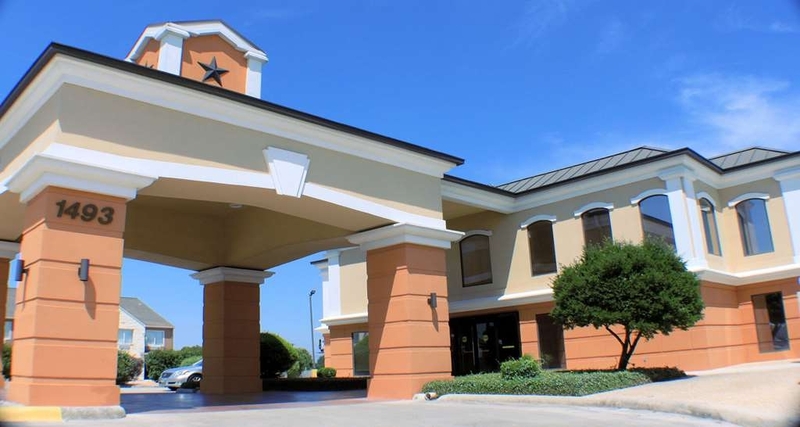 "Visiting family in New Braunfels"
The hotel is in a nice location, near restaurants, grocery stores and large shopping center which is the nicest shopping in New Braunfels. I would recommend this place. We didn't eat breakfast so I can't comment on it. Excellent location.The hotel was very clean and the breakfast was excellent, with a large selection of breakfast foods to choose from. The staff was very friendly and helpful.They went out of their way to provide us with information about Gruene Hall and the Gruene area when we inquired at the front desk. We don't always choose Best Western, and this was a very pleasant surprise. Clean updated, great breakfast and very comfortable common area. We had one of the drive-up rooms. Very handy for unloading. We would stay here again. We took a couple of days to just get away from everything. The room here was excellent. Getting a suite was well worth it. The room seemed state of the art. So far in visiting about 8 Best Wedterns, this was the best. 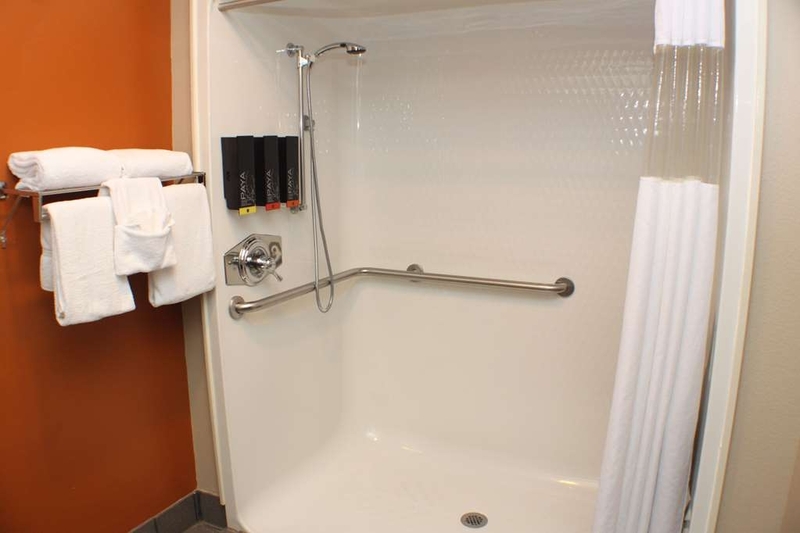 "ADA shower was amazing "
Room was one of the best ADA rooms I have been in the shower was perfect safety wise. Breakfast was fantastic and we loved the Texas waffles and there were tons of toppings options. Wendy was super helpful with breakfast options. Was amazed at the warm options for food. This was number 1 in all areas. 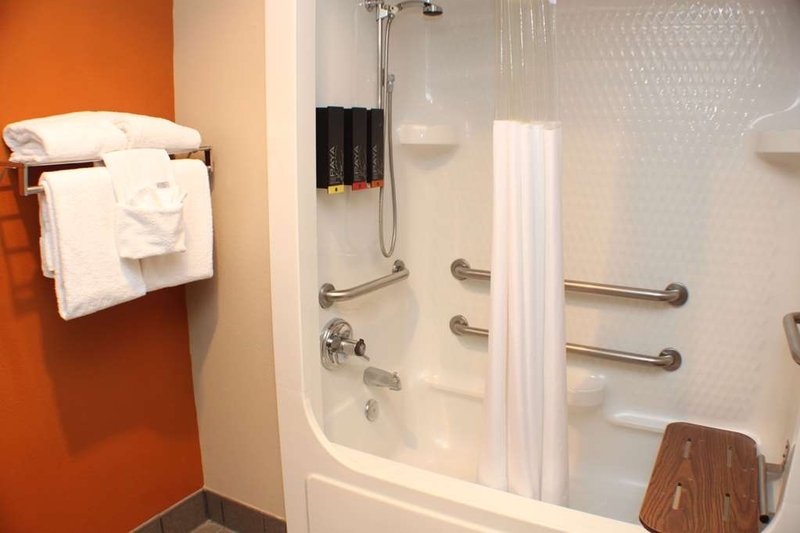 Room was spacious, handicap shower was great, bed very comfortable. The staff was very friendly and accommodating. Breakfast had numerous choices. Will always stay here when through area. One night stay - very nice suite; extremely clean Bed quite comfortable—————- Nice selection for breakfast———— Front desk employees were friendly——- Quick checkin and check out——- Would definitely stay again!!!! "False fire alarm in middle of night"
Staff oblivious to concept of legitimate compensation for lack of sleep from alarm, gave us a bottle of water! Price was very high for quality of room. $150 plus tax. Quality of rooms very average. No explanation for fire alarm in whole hotel at 4am. 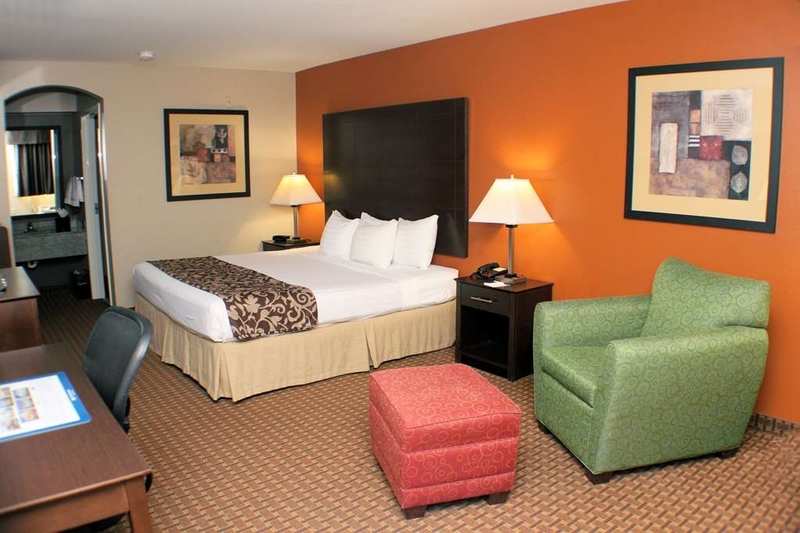 Thank You, for staying with us at the Best Western Inn & Suites in New Braunfels, TX. We do apologize for the inconvenience of the false alarm, going off in the early morning. Our staff determined that it was a false alarm and followed the procedures of resetting the system in a fast and timely matter. It seems like your stay was during Wurstfest. 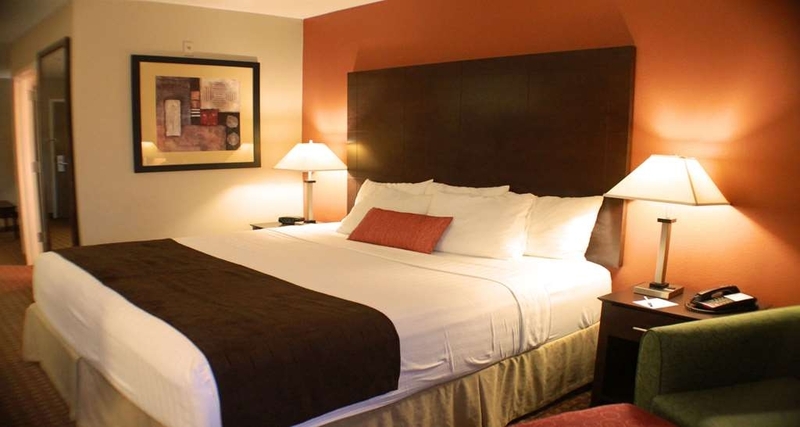 During peak times or special events, our rates are higher than usual. I hope that you will consider staying with us again so that we can have another chance to provide you with a superior experience. "Great for business or pleasure." Rooms are very spacious and service is the best. Loved the free made to order breakfast and the evening managers special each evening. (Free Drinks) Attended a convention but would definitely stay for pleasure. Outlet malls (Texas Greatest) just a few feet down the road. 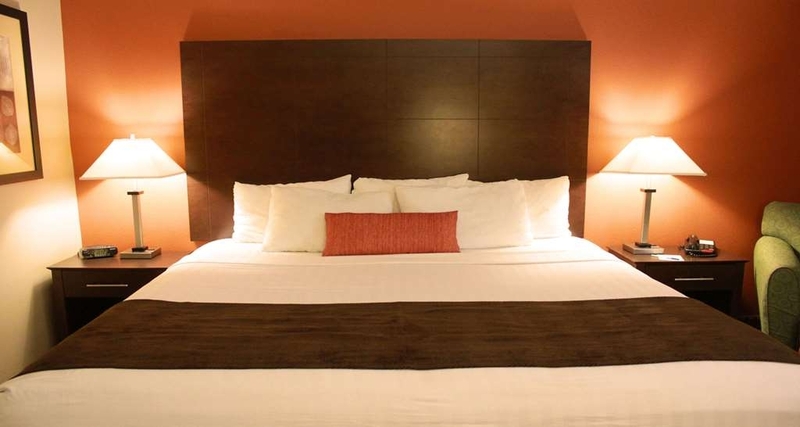 "US Gran Prix Weekend Stay"
Looking for a nice place to rest at night during the US Gran Prix ? Or any other time you need a comfort stay? This BW hotel is very convenient, and very comfortable. The entire Staff works very hard to make yours, my stay, very comfortable. The overall hotel (lobby) very nice. However the rooms were full of mold, huge stains throughout the bed skirts, and a huge tear in the carpet all the way down to the wood planks. Also, the smell of mildew was horrible. We were shown other rooms but found them in the same condition with mold, smell, and stains. Thank you, very much for staying with us at the Best Western Inn & Suites of New Braunfels. Sorry to hear you didn't enjoy your stay with us. The issues with the bed skirt being stained during your stay has been replaced. We are working on getting the door frame adjusted, so the door doesn't rub up on the carpet. We have not gotten any complaints about mold being in rooms before. As a precautionary measure, we have put an ozone machine to combat the air quality of that room. I understand you were not satisfied with your initial room, but the other rooms you were shown had no issues. I hope that you will consider staying with us again so that we may have another chance to provide you with a superior experience. This hotel was easy to find, right off the highway. Staff was friendly and accommodating for my very late check-in. Room and bathroom was clean. Not used to accessing room from outside but surprisingly there was very little noise. A nice touch was the dispensers of shampoo, conditioner,lotion, hand/body soap. Easy check-out. Very clean room and friendly staff. Breakfast was handled by Wendy who did an excellent job making sure we were taken care of. The main desk contacted shortly after arriving in the room to ask us if everything was alright and to contact them if we needed anything. One of the better Best Westerns we have stayed in. The continental breakfast was a joke. The TV remote makes you feel like you're in the 90's. no TV guide, no movie options. Only click through channels. Room smells musty and every time we walked outside we smelled pot. Overall the stay was underwhelming. If the breakfast was better it would have been tolerable. Thank you, very much for staying with us at the Best Western Inn & Suites of New Braunfels. Sorry to hear you didn't enjoy our hotel breakfast buffet. 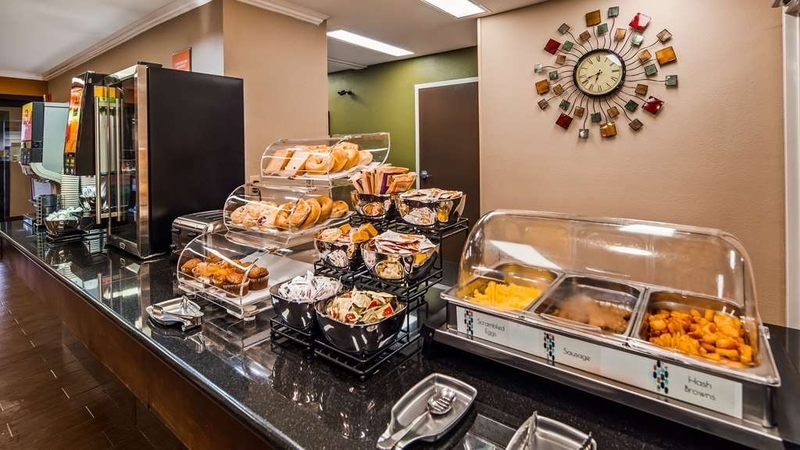 Our breakfast buffet includes eggs, sausages, potatoes, waffles, yogurts, cereals, fruits, breads, bagels, muffins, danishes, milks, juices, coffees, and etc. Our television do not have menu guide options, but they are all HD cable channels. We take smoking complaints very seriously. During your stay with us, we didn't receive any complaints of other guest smoking. I hope that you will consider staying with us again so that we can have another chance to provide you with a superior experience. "A good place to stay for Gruene Hall shows"
Our family had a good overnight stay for a Gruene Hall show. This motel is clean, modern, has an ample breakfast, and a nice pool. Also a good location directly off highway and you can then take side streets into Gruene, avoiding traffic congestion with quick access to parking spots near activities in Gruene. I booked two adjoining rooms (called the hotel direct to verify) for my family of 6. When we arrived all the adjoining rooms had been already rented out. I asked to speak with the manager and he would not speak to us. I called Best Western corporate and they were not interested in helping and only said that they did not hear the phone conversation when I booked the adjoining rooms. We did not stay and will not come back to this hotel. We did our very best to accommodate you, but at the time of your arrival, we were unable to grant your request, of adjoining rooms. We did reach out to you several times, on the day before your arrival with no response from you. Requests for adjoining rooms are not guaranteed. Upon your arrival we offered you a complimentary upgrade or a cancellation, without a charge, you chose to cancel the reservation. Very friendly and helpful staff. The rooms were very clean and A/C was running and already set on 65! The Continental breakfast was great with many items to choose from. They offer a Military and Veterans discount, I will definitely stay here again. Room nice cool and clean.No smelly room.Food was great.Location was awesome! !We will only stay at best western hotels.We rented 2 rooms and they made sure they got us next to each other. We used our AARP discount with NO problems.A lot of shopping and great restaurants that were easy to get to.Just a wonderful experience ALL the way around. We stayed here in July 2014, as well. The hotel looks even better, and "fresher" than it did 4 years ago. The place is clean and comfortable. The staff was friendly and accommodating. I was impressed by the maintenance staff power washing common walkways. It was obvious the staff took pride in a clean appearance. I didnt see any cigarette butts or rubbish in the parking lot. The kitchen worker tasked with running the free breakfast did a great job keeping everything stocked and fresh. I did deduct one star because the breakfast foods themselves lacked variety. Some bacon, and fresh potatoes and tortillas would remedy that. The eggs, sausage, and waffles were awesome, as was the woman preparong and serving them. Great location very close to the water park. Bed was uncomfortable. Breakfast was great. But an ok stay. Was quiet though. Hotel probably needs to be updated. Location was great and easy to find. Didn't really have to interact with the staff. Thank You, for leaving your review. It is odd that you said our mattresses are worn out, because our mattresses are not that old as your describe, and we often get compliment from our guests. They often call to find out the brand and where they may purchase these mattresses. We have inspected our all of doors and sinks and haven't found any of them to be loose. Please send us your contact info at [email protected] or (830)625-7337. I would like to further review your experience further. I hope that you will consider staying with us again so that we can have another chance to provide you with a superior experience. Great time the rooms were very clean need more discounts. The staff was very nice and courteous they have plenty of pillows on the bed the mattress were a little uncomfortable but everything is was great. Excellent place to stay! Exterior had me concerned, however it was quiet and clean. Staff was extremely helpful. The rate was extraordinarily cheap considering the rates of nearby hotels. Easy to access as well. 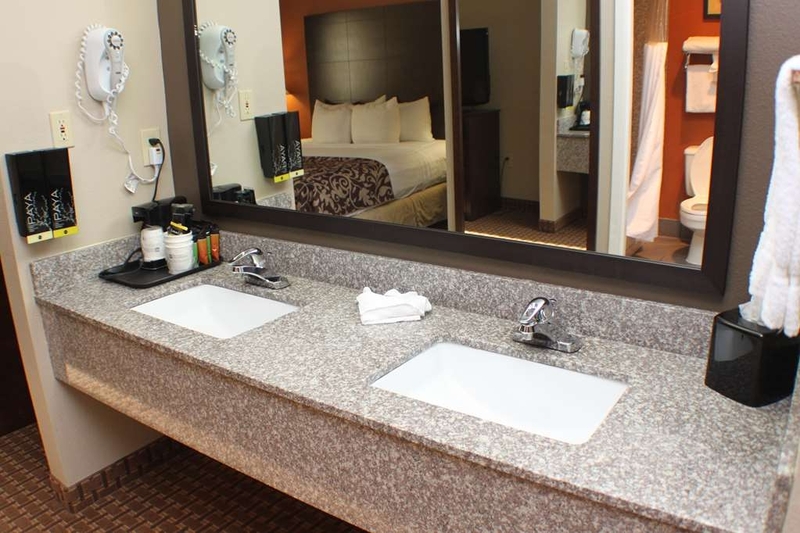 Clean hotel in a relatively quiet area even though it is located by the freeway. Very friendly staff and clean rooms. You won't go wrong staying at this hotel. Very nice place for business or pleasure. We found our room to be very clean and quiet. The front desk personnel in the evenings was super friendly and she was so helpful, going out of her way to help us have a wonderful experience exploring New Braunfels. A real treat after spending a hot day site seeing was returning to find cucumber water and lemon/orange water in the lobby. "Bad pillows and humid smelling room"
We arrived at 3 pm and checked in then left hotel to go visit friends. When we came back around 10:30 the room had a musty smell. We over looked and and tried to go to sleep. The pillows we so high that my wife and I could not sleep. I then got dressed and went to the lobby and tried to get pillows that were not so high. I was told they did not have any and the hotel was sold out. I called the manager this morning and he said that was the only pillows they use. I asked him if he could make some kind of credit since we were unable to keep and had to check out and drive 2 1/2 hours back to Houston. He said no. This is why I do not recommend this hotel. Thank you, for your review. We only use Comforel ® pillows at our location, as do many other hotels in our brand. I apologize these are not to your preference. It is strange you smelled a musty smell in your room. We have a thorough deep clean, and preventive maintenance programs, to correct these types of issues. A refund was not given because of the duration of time the room being occupied. "Do Not Stay here! Rooms are nasty and Dirty. and the phone when you touch sticky"
I would not recommend to stay here. It's over priced and Rooms are dirty and old. smells bad. Also when you walk in to bathroom you find a hair in tub. Oh no who wants to stay here with hair!!! Front desk is very poor in service. Thank you for staying with us here at the Best Western Inn & Suites of New Braunfels. I apologize for your issues with your room. We do everything in our power to make sure our guests have a great experience staying with us and will use your feedback to help in staff training. We are competitively priced for our market. Our weekend rates are higher than our weekdays, and we have a great selection of room types for all our guest's individual needs and prefrences. Thank you again for staying with us, and thank you for this review. We take all reviews, good and bad to heart, and try to learn from each of them. 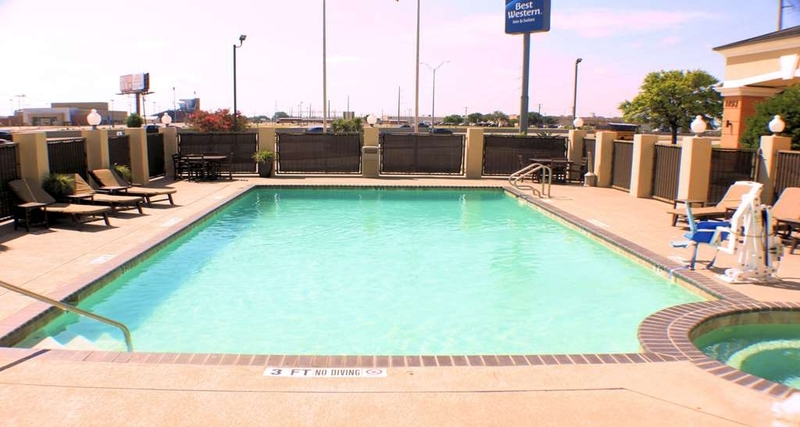 Hotel is in a very convenient location, close to the freeway and close to a very nice shopping center and a huge brand new HEB grocery store. Many fine restaurants are close by. The staff at the hotel is great and the rooms are very nice. I would recommend this place. Over priced for the accommodations, understaffed and the staff they do have seem to be untrained. Took forever to check in and out due to 1 employee and that employee had to call the manager offsite to ask questions on how to check out. Thank you for staying with us here at the Best Western Inn & Suites of New Braunfels, TX. I apologize for your issues with your check in and out experience. We will be implenting more training for some of our newer staff. We do everything in our power to make sure our guests have a great experience staying with us and will take your feedback into consideration. This is not an "inn and suites." Though the staff was friendly, it is a motel with room doors to the exterior of the building. Room smelled musty. The pillows are small squares (half the size of a regular pillow) and very lumpy and hard. This is NOT a $160/night accommodation. Head to the Motel 6. Thank you for staying with us here at the Best Western Inn & Suites of New Braunfels. I apologize for your issues with your room type. We have room type options available, for both the interior as well as the exterior. We do everything in our power to make sure our guests have a great experience staying with us and will use your feedback to help in staff training. Thank you again for staying with us, and thank you for this review. We take all reviews, good and bad to heart, and try to learn from each of them. Staff were very friendly and helpful. Location has several places to eat with a variety of frestaurants within a half a mile of sidewalk walking. Very nice breakfast and room was super clean and very modern. Quiet even though close to the freeway. "Older, Outdoor corridor type motel"
I made my reservation on my phone and couldn't really see the photos of the outside of this motel. I was very surprised when I checked in and was told we were on the top floor and there was NO elevator. I have not seen a motel like this before, where a few of the rooms are off the lobby with inside corridors and the rest is an old style motel with outside staircases and corridors. The front desk staff and breakfast staff were all very friendly and everyone spoke when they encountered you. The lobby and rooms have been updated nicely. The door to our room was hard to open and close. I could not get the deadbolt to lock due to the door being off kilter. My husband had to work at it and force it to lock and also, the safety hasp was hard to deal with. The road outside the room was very loud, but we did not hear any noise with the A/C going. "Great stay on vacation "
Spent 2 nights visiting beautiful greuen and new branfields areas. Hotel was top notch with a suite that was perfect for 4. Beautiful hotel, great breakfast, quit and spacious time as expected by my favorite travel hotel, best western. The young lady at the front desk was a lifelong resident and gave us great places to eat and visit.Thank you Kelsey. 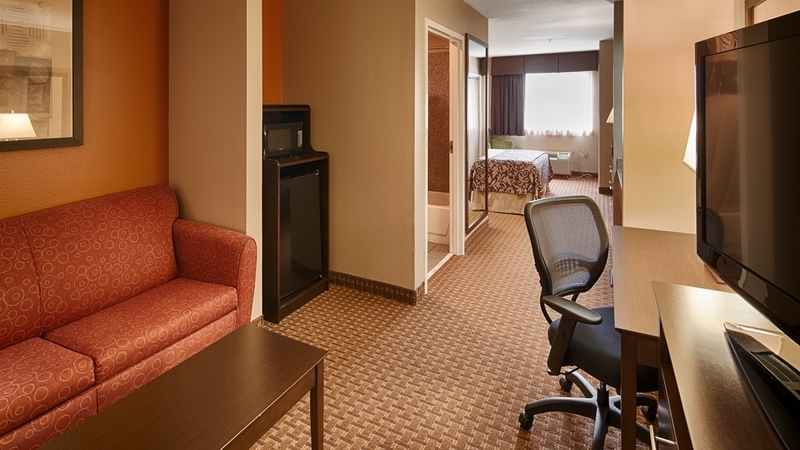 "A great location in a busy city...."
We enjoyed our stay in our suite at the BW . Our room obviously had been renovated and new amenities added to make our stay more comfortable. The staff were very pleasant and accommodating. The breakfast was very good and the very nice lady in charge supplied more food even though we were getting close to closing , very friendly & nice ! Three of us stayed in the suite . I took the sofa bed. Unfortunately this was probably the worst mattress I've slepted on that I can remember. They'll have to make that one upgrade to make our stay perfect ! loved the location my room was very clean. Kelsey at the front desk was very nice could of given us a layout on the hotel so we would know where the ice machine, laundry room and pool where at instead of getting lost. the light about the vanity flickered all night we asked housekeeping and front desk to send maintenance but no one showed up and also the hand soap dispenser kept on opening up. but we did have a relaxing time and would visit again. Nice, clean, quiet hotel. Stayed one night in March. Friendly staff, good breakfast with both hot and cold choices. Excellent location. Solid WiFi. Very reasonable price. Would stay in this location again. this place is reasonably priced and has easy access to IH 35. Lots of places nearby to eat. Only minutes from downtown New Braunfels. It is also only a few miles down the road from Camping World. The free breakfast pretty good; it is much like the free breakfasts at other motels. The room was clean, roomy, and comfortable. Excellent hotel. Rooms were new and remodeled. Spacious, we'll laid out. The bed and pillows were very comfortable. Linens and towels new and snowy white. The hotel grounds are well lit, and safe to go out after dark. Breakfast was extensive and very good. Staff at desk could not have been more helpful and polite. Will return when in area again. Jennifer was excellent!!!!!! and was so attentive with al us!!! The service was very good and the installations were excellent The breakfast was delicious ando have variety and it was always hot! Thanks for everything. "Saved me and my dad"
Jennifer who works in the front desk helped me out so much. I needed a last minute room for cheap for my dad and I because something came up and he couldn't stay with me at my apartment. She was so nice, so polite and gave me some great information. Two thumbs up Jennifer???????? Great price and value. Close to shopping and great places to eat. Great value for the price. We missed the free breakfast since it was over at 9:30 and we slept in. Room was very clean and staff was very friendly. The hotel has everything ypu need, its clean, has a hood room and bathroom, the breakfast was good. Yhe location is convinent yo interstates, resturants and the local Harley davidson dealer is just a few minutes away. "Nice Threee Night Stay During Wurstfest. Best Western"
We stayed in a very nice suite room in the main building at the Best Western. There is a nice living room (convertible couch) side with TV, microwave, refrigerator, and coffee table. The other side had a very comfortable bed. There was a nice desk area. The bathroom was good and the sink area had two sinks. We enjoyed the complementary breakfast in the mornings. It was also nice that there was flavored water out all day long. We loved that. Since we were there for Wurstfest we used the Wurstfest bus to get to the festival. They had a bus stop there. As such, it worked very well. We did laundry there as well. Parking is free. Internet connetion was good. Made my first visit to Wurstfest, and chose Best Western based on location, pricing and reviews. Stayed 2 nights in a King Suite which gave us plenty of room with a small fridge & microwave, in addition to a separate sitting area with a second television. Our room was just off the lobby, but was still one of the quietest we have enjoyed recently. Although I used Tripadvisor to help make my hotel selection, I did find lower pricing through the BW Rewards members' website. Very pleasant stay in this clean well-kept inn, and will return for any future visits. In town for fun and shopping. Made last minute reservation and it was the weekend Wurstfest started. Should have been a clue. Dark rooms, roaches and a very rude manager. Rates don't match Trip Advisor unless you specifically ask. Will not be back!!! Good hotel, better staff. Hotel is starting to show it's aged but overall is well maintained. Hotel met or exceeded all of my expectations and requirements. Very good selection of breakfast items. The staff were super and really are to be complemented on their customer service skills. Was a very nice place to stay. Employees were very helpful. Room was very comfortable and clean. Pool and hot tub were clean. Was nice having a washer and dryer to use. Breakfast was usual hotel fare but hot and was always full. Our stay at this hotel was nice. The room did not smell bad, in Our stay at this hotel was very pleasant. the room did not smell bad,in fact it smelled nice. We highly recommend this hotel to everyone. Hotel staff were very courteous and friendly. The bed was comfortable and cozy. The TV and the stations on it were good. "my stay in new braunfels"
Fantastic hotel and fantastic people. I have stayed there before and will stay again if I ever need to do business in the area. the breakfast was hot and fresh and greatly appreciated. The room, bed, clean towels were everything I wanted and expected. Stayed two nights with no issues. Breakfast was better than average and the nice girl taking care of it kept asking if we needed anything. We got a smoking room in the back with no stairs. Would stay again. Had I known this hotel had no elevator, I'd have chosen another one. They certainly don't explain that on their website. I'm not handicapped, but hauling 200 lbs of luggage up a flight of stairs is hard on an old man and an old woman. "Pool disgustingly dirty. Room was not clean." Diamond member: Put us in a second story room w/no elevator during a very low guest traffic time. Pool had diaper material floating along w/other materials. Water clarity very poor. AC was quite good. The room was adequate. The weekend maid service was bad! Friday morning it looked like a 2 year old made up the room! Saturday morning someone put a do not disturb sign on our door, probably the maid as my sign was still inside! Breakfast was okay, nice young lady refilling when necessary! I would give the whole experience at best a 3. If you have physical disabilities you would have a hard time using their toilets! They were so low to the ground, more suitable for kids! 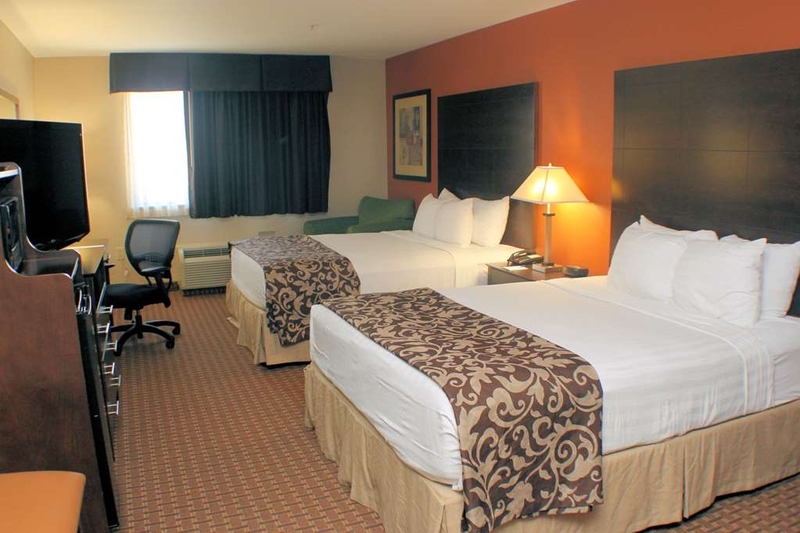 Comfortable beds, clean rooms, nice selection of breakfast items. Conveniently located, short driving distance to restaurants. The lobby was comfortable. I would return. This is silly, but it was very hot when I was there and in the lobby there was ice cold lemon water and cucumber water. That was a nice touch! Very nice hotel. Great breakfast. Beds could have been a little more comfortable. We had a double queen and one could not be slept in due to every time you made any type of move it would squeak. The other made our back hurt. Other than that, the stay was nice. "Always stay here when we are visiting relatives. Very convenient location." Great breakfast, pool area and rooms are always clean. I would definitely recommend staying here. It is convenient to all area tourist spots and restaurants. It is also convenient to Interstate 35 and close to shopping centers. Stayed one night on a quick trip through the hill country. A bit dated but was ok for a night. Price was a little high for the level of hotel but it was a last minute reservation on a Saturday during the summer so a lot of hotels were full. It is relatively close to the rivers and Gruene. We stayed at the New Braunfels Best Western for a weekend river float trip- it was very clean and updated and had a free breakfast. This hotel was perfect for a weekend visit and I would stay here again! "Great place and perfectly located"
On a last minute change in hotels they got us in and reservations were made. Check in was a breeze...and breakfast was great! The wife is particular about hotels and she was very satisfied with it completely. "Worst Hotel I have ever stayed in." I booked this hotel because of the ratings and reviews from trip adviser. So I at least expected it to be clean and upgraded but instead found it dirty, needing remodeling and a staff that really didn't care. Not to mention the free breakfast that was stale and hard to believe it was considered breakfast. I spent the first night cleaning the bathtub drain of someone else's hair clogging the drain. Pleased do not recommend this hotel to anyone. The best place I've stayed in. Staff people are very courteous, they're always eager to help with any needs. Front desk people are the best. They go out of their way to assist you. Rooms are well cleaned, well stocked, my room is always clean. plenty of parking space, great swimming pool, great landscaping, their breakfast is always good and hot. Easy access in & out of the area, easy access to HWY35. Very nice hotel just off of interstate 35. The room were very clean and the bed was very comfortable. the Breakfast was very good with a large selection. There are several Restaurants in the area either fast food or sit down. Honestly, this place is pretty run down. The rooms are musty, the housekeeping staff passes by rooms without cleaning them, and the price for what you are getting just does not cut it. While the Front Desk staff was helpful, our room did not get serviced with any kind of regularity. 2nd day, not at all, in fact. Had to ask for coffee every day. Breakfast was decent, but the same every day. Most places rotate that. "Great stay if you like bugs and your feet turning black. " We arrived Friday. We booked 2 rooms. First off, the rooms smelled musty like it hadn't been cleaned. Mirrors were dirty and dust on all the furniture. We found a huge water roach in our room hallway. We were told by the front desk that it is expected being hot and in Texas with a room by the pool. UNACCEPTABLE! Then my sister pulls back her bed sheets and finds a smashed spider. We ask for the bed linen to be changed. The front desk lady said no one is here to change them, but gave us sheets to change them ourself. Then we found a dead scorpion in the room next to the door. at this point we are tired and just want to go to bed so we don't tell them about it until the morning. When morning gets here, we find a fresh dead water roach in sisters room; and we find a live water roach hanging out on our pillow that fell On the floor! We tell the front desk lady and she just stares at us and takes notes. She seemed agitated. I also told her that our feet are turning black when we walk around the room. She had no idea why it would do that. Obviously, the room is dirty even though they said carpets had been cleaned two weeks ago. The breakfast was fine. Nothing exceptional but they had waffles, eggs, sausage, hashbrowns and typical pastries, bread, fruit, yogurt, cereal and bread. The next night was fine except the dead scorpion that was in the corner was now in pieces in front of the door. They swept it out of the corner but didn't vacuum up the body pieces. That night the rooms were cleaned better and they even arranged my daughters dolls cute. But the last night we get home from a long day at the water park and our room is half clean. One bed made, the other how we left it. The sink dirty but the toilet was cleaned. It's like they quit half way through it. Our other room didn't get cleaned at all. My sister got in at 5 and the room hadn't been cleaned at all. House keeping showed up around 5:30, so they told them don't bother we are in for the night. My niece found a roly poly in their room. We talked to a manager twice and he apologized and said they have pest control out monthly and was surprised by the bugs. He discounted our rooms $20 a night for 3 nights since we had issues 3 out of 4 nights. Our rooms were in the inside part connected to the office, so those complaining about the outside rooms thinking inside rooms would be better are wrong. This was our first stay at BW and our last. We will stick to Baymont Inn next time! We came for vacation but because of the bugs we couldn't sleep well. "Dead bugs and broken door"
Door had gaps under and over letting all cooling out. Looked like it had been kicked in before. There was also a dead bug laying a foot from the bed. Good hotel for the price but unless your standards are low, this might not be the hotel for you!! "Instant coffee and soap pumps in the tub"
This hotel has adopted the use of an instant coffee machine instead of brewed coffee in the lobby. This practice made a nice breakfast unenjoyable. I had to go down the street to get a good cup of coffee. They also used pitchers of milk instead of individual containers and one may question the sanitary practices of a hotel kitchen. Soap and shampoo pumps are installed in the tub which you can't reach if you sit to wash. The general feeling is that the management has put bulk quantity pricing above customer comfort and convenience. This is too bad, I was just starting to regain my trust in BW again after a long absence. Very nice hotel. Would stay there again. The breakfast was very tasty and the kind size bed was very comfortable. Parking was also very convenient. The location was right off the highway making travel to San Antonio very easy. The receptionist went over and above to accommodate our disability needs. All the staff was extremely helpful. Bed was very comfortable. Room was quiet. Great experience. We will definitely use this hotel next time we are in New Braunfels. We stayed one night. We arrived early but our room was ready. The shower and sink dispensers were nice. Since we were only staying the one night in was helpful not to have to unpack all of our shower stuff. "Good Location to several local aminities. Biker friendly"
The hotel is on 35 but very quiet. Close proximity to Gruene, good restaurants and some great roads if your a biker. Clean rooms, bathroom, and comfy bed. Breakfast hot and plenty of choices to get your day going. "Stay in the main building only"
Stay in the main building only. The older separate building rooms are not clean, staff was not good in the middle of the night when there was a problem with the bathroom. Killed cockroaches in the mornings no. Ugh. I stayed there for 3 nights to visit my daughter and attend the Texas State University graduation. It's located right off of the interstate. 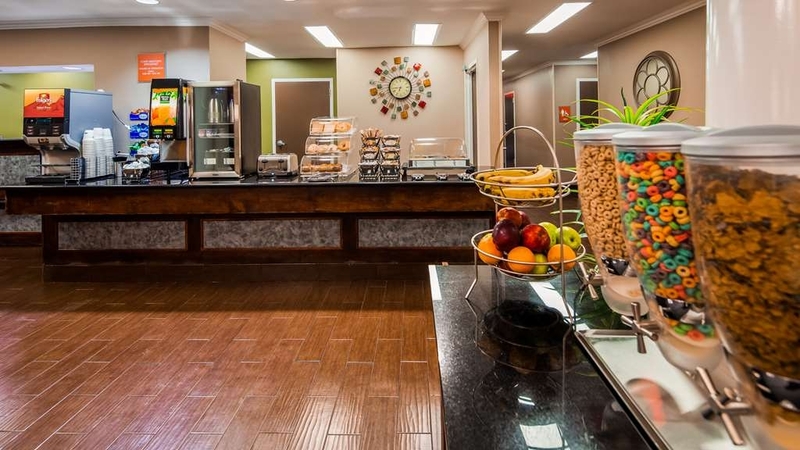 The room was clean, breakfast had a variety of items to choose from, and the staff were friendly and helpful. "Not the best place "
The hotel is an older hotel but it was clean and the pool was nice. Our room was not ready at check in but we enjoyed the pool while we waited. The pool area was clean but no towels out in the towel area that was marked Towels. It was good but not great for the price. Shower backed up when showering. By the time I finished my shower I was ankle deep in soapy water. Room was clean. On 2nd floor and there is no elevator for those that have problems climbing stairs. Breakfast was just OK. I think it was to high priced for the age of the building. Employees were nice. Easy access to I-35 freeway. i booked my room in January for a wedding at the end of April. When I arrived at the BW in New Braunsfuls at 3 pm(which is check in) my room was not ready, nor had they even started on it. The wedding started at 5 and we were 30 minutes away. I still needed to get myself and 3 children ready. I was doing my childrens hair in the parking lot. Finally when I get a room 45 minutes later it's the wrong room. I had reservations for a room inside access. We were on the side, bathtub was dirty, and lights didn't work. I did not complain because we did not have time to change rooms. Very disappointed. We always stay here every year for Wurstfest and have never had any problems with our rooms or checking in. Overall, the hotel location was great! The only downfall is they have no elevators. You have to walk up two flights of stairs. And I think it should be told to you prior to your arrival. Other than this it was a good stay. 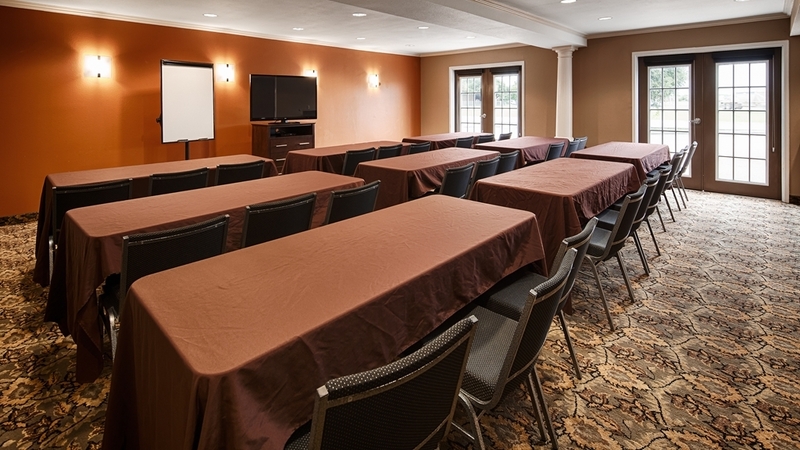 Very nice room and convenant location in New Braunfels on the interstate service road. Motorcycle friendly and they offer a great breakfast. Best Western as usual was top shelf. I would recomend this motel if your in the New Braunfels area. "Out of Mexico and on to New Braunfels, TX"
We began our drive from Matehuala MX in the morning. Crossing the border at Laredo Texas, our planned destination for end of day was San Antonio. Good traffic. Good weather. Plenty of Sunshine. We decided to push on to New Braunfels, TX to put us on the other side of San Antonio city freeway rush hour traffic! Oh my gosh was this smart! Arrived at the hotel and we were sooo pleased that Best Western once again delivered a great property for us to relax and recover and recharge. Awesome great breakfast buffet set up in the morning. 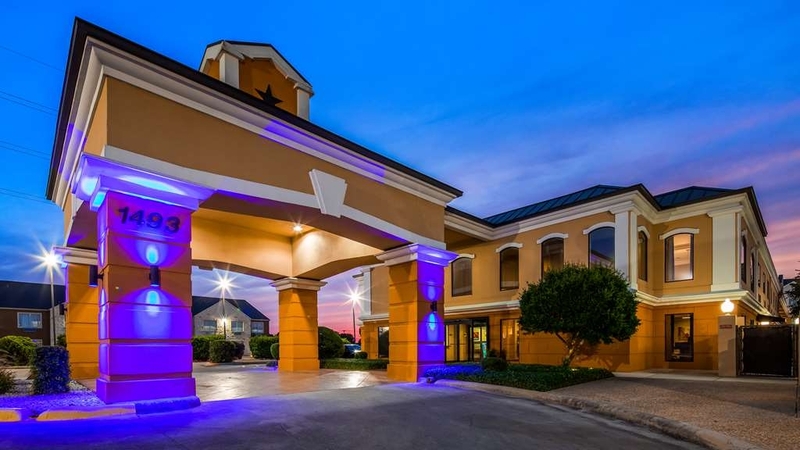 If you are traveling through.. Push past San Antonio and enjoy this clean and quiet Best Western outside of the "big city" !!! "Ummmm, Best to keep Driving"
Best Western has its up places and its down places. This is not a good one. The staff is OK, but the place is run down and tired. Our room was plenty big, but there was a terrible odor in it, from what seemed like some kind of sanitizer sprinkled on the floor or sprayed in the air conditioner. It was worse when the air was on, but this is Texas, right? It was sort of a heavy rosy something-or-other smell. I could not wait to leave. My guess is it covered some sort of mold problem. Bathrooms, just OK, although there was some kind of Gak on the toilet supply tube. Both faucet knobs on the sink were loose. One turned all the way around in a circle, and the other was backwards - cold to the left, hot to the right. The door to the parking lot is open and not badged, so security is not impressive. Breakfast gets a C. My grandson needed the sofa bed, and there were stains on one side of the couch cushions and rust on the bottom side of the mattress, where it touches the frame. The pool looked nice enough, but it was dirty it had leaves (or WORSE) lying in the bottom. I would not let my grandson go swimming in it. I don't know. It does look like maybe they are trying to repaint, etc, but this place needs a big infusion of cash, but I think it may be something corporate is going to need to help out with, because it is just not up to what so many good properties look like these days. It was not even really that good a deal honestly. . I had to remind myself that I had chosen to stay here because once I got there I noticed that it lacked the quality that I experienced at the last place I stayed at. Upon entering the room there was some sort of smell, probably from it being cleaned. The bed was comfortable. In order to get ice I had to leave the building. Take note that part of this hotel is accessed from inside and part has outside entries. I would advise that you spend a little more money and stay at a nicer place. "It was ok. Expect more"
Arrived around 845pm on a Friday night. The front desk agent wasn't exactly as friendly as expected in the hospitality world. She was helping me and was rude to another guest that was asking a question while assisting myself. Room was clean and beds were soft. It was nice to have a fridge and microwave in the room. Stayed in room 114 and carpet was torn going into the bathroom but overall I didn't see any stains or anything. The lighting in the bathroom could be better! My son swam in the pool and he loved it. It was bigger than expected and pretty clean for being outdoors. The next morning for breakfast there was a decent amount of choices. Eggs, sausage, hash browns, yogurt, pastries and waffles. They had a waffle bar with multiple choices that my son loved! After breakfast I stopped by the front desk and said "excuse me, do I need to stop by the front desk to check out" the agent was looking at her computer and never made eye contact with me and replied "only if you want a receipt" not in a friendly way. Then I replied ok thank you. Her reply was "uh huh". If it wasn't for the 2 different unfriendly agents I would have rated 4 stars. I work for a 4 star resort in the hill country so I expect more professionalism from front of house employees. Overall for the price I will probably stay again for a quick trip but wouldn't stay for an extended vacation. "Last Minute Spring Break Getaway"
We had room 110. It was very nice and we were very pleased with every aspect. Take exit 189 instead of 190 though, from north. Much easier to reach. It is right off the interstate but was quiet. Breakfast was good and desk clerk was very helpful. Stay here! it was clean and for the price it's much better than other hotels in the area. 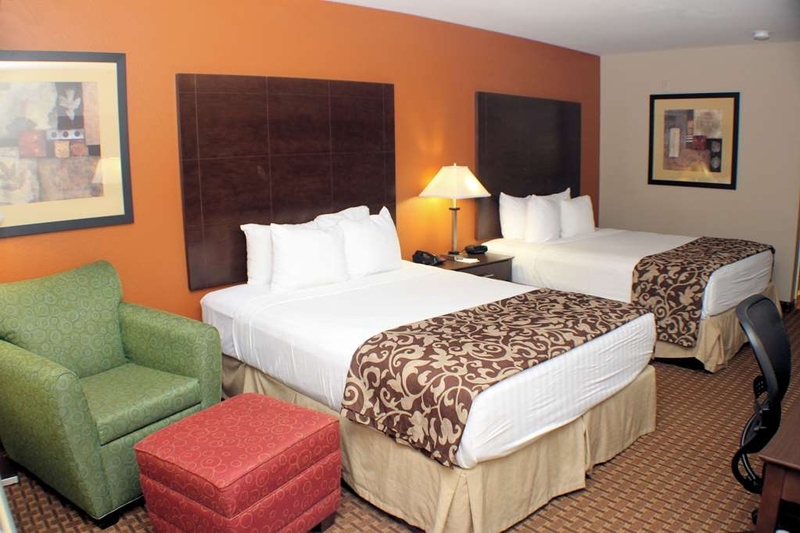 It's convenient, very close to Gruene and other sight seeing locations. We were surprised and would stay here again. Check in was quick and easy at 12am. The room was clean and bright. Very comfortable bed after a long day of traveling. Our tub was draining very slowly so we took a bath and shower at the same time but we let the front desk know and they took care of it. Breakfast was delicious and all staff were very friendly. Primarily we stay at Best Western or La Quinta. First time at this particular Best Western in New Braunfels,Texas. It met the high standard I am accustomed to at Best Western. Will stay there again in near future. The attendant was very welcoming, the room clean and large and the situation convenient, easy to find. We came back again later in the month as we were attending concerts in the area. We'll come back in our futur travels in Texas. Had a great stay at this hotel. The staff was very friendly and helpful. I just wish I had gotten their names. The nice lady breakfast attendant was extremely nice and made sure that we had everything we needed. Also the breakfast was good, especially the sausage patties. The room was clean and had comfortable beds. Hotel was easy to find. "not as nice as i expected"
It was ok but had parking outside room . old fashion room . clean and breakfast good but would have stayed at comfort suites instead . It cost only 10 dollars more. Prefer indoor hallways more than door on outside and stairs. Probably won't stay there again I like hotels with indoor hallways and elevators and indoor pools etc. Room was in excellent condition and the continental breakfast was better than most for the price. Overall it was a pleasant experience. I would recommend The Best western to anyone looking for a good value. The Western has come a long way. The rooms were very clean. No blankets. ...you had to ask for one. Very good shower pressure. Average breakfast. Cable stations don't lineup with the guide on tv. No elevator for anyone that is handicap. Rooms had fridge and microwave. We have stayed in this hotel on previous occasions. The staff is always friendly and helpful. The rooms are always clean. The breakfast is hot and fresh with a good variety. The pool was clean and there were tools provided poolside. "definite surprise quality for money"
I made reservations on line. Upon arrival the clerk checks us in and explains what stairs to take. I asked about the elevator, she said we don't have one. I said my daughter is expecting and I am not able to carry luggage up stairs. She said she could relocate us. She checked and the only thing left was the handicap room, not a problem. Then she said it would be a higher rate due to location. Seriously???? The breakfast was not good. Runny eggs ...and the steamers smelled odd. Room was clean and cool when we got there! We had no complaints except that we paid $135 on Sunday night and when we called to come a day early on Saturday they charge was a whopping $179. Definitely not a 5 star hotel to be charging that price but we did it anyway because we didn't have a choice at that point. Hot Breakfast was great and make your own waffles!!! I left an expensive cross necklace on the coffee maker in our room and called 4 hours after we checked out and they had the necklace and shipped it back to me. We have stayed in numerous hotels before and left many items and this is the first one to be honest and turn it in. We will definitely stay here again and recommend to others. Very good, clean, safe. Good breakfast and general service is warm and cordial. 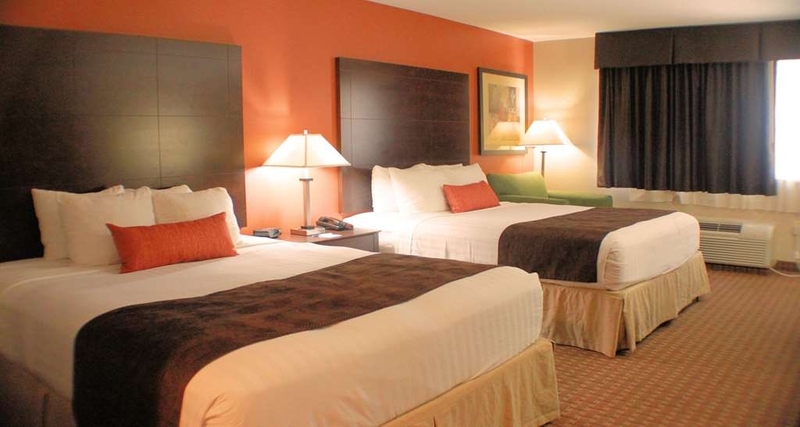 They are ready to help.The location of the hotel is great right on I 35 with nearby grocery stores and restaurants. I liked it very much. Overall, I was not satisfied with our stay. There was no trash can in the restroom, and I assumed we needed to flush the toilet paper. Well, when we did, the toilet started to overflow. The carpet got extremely wet, and we had to wear sandals/shoes at any time we walked around the restroom/sink area. I indicated to the front desk staff what had happened, but I was told it was not a big deal, and that it would slowly dry. I didn't expect to move to another room, but I at least expected for someone to ask if we would still feel comfortable staying in the same room. Other than that incident, everything was fine. 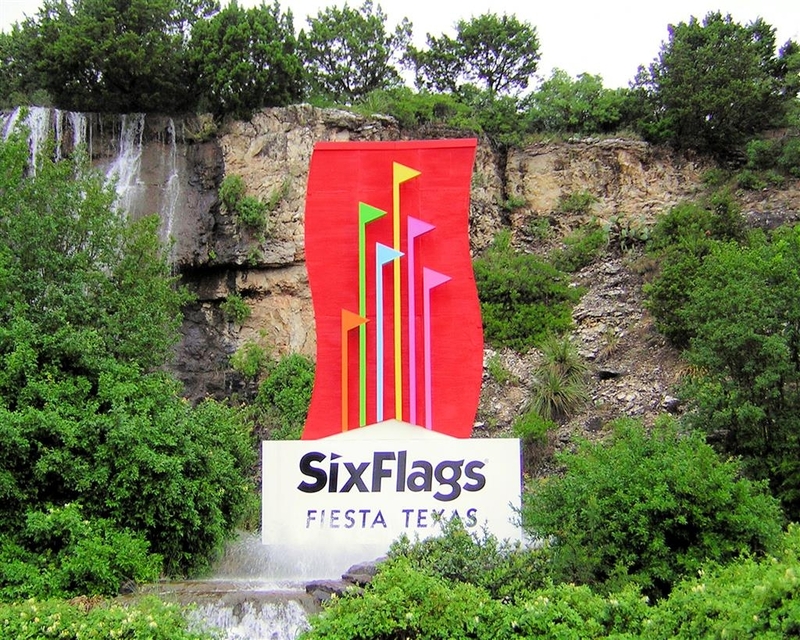 Drove in from San Antonio, great location to visit the Schlitterbahn Water Park where we spent the full day there. 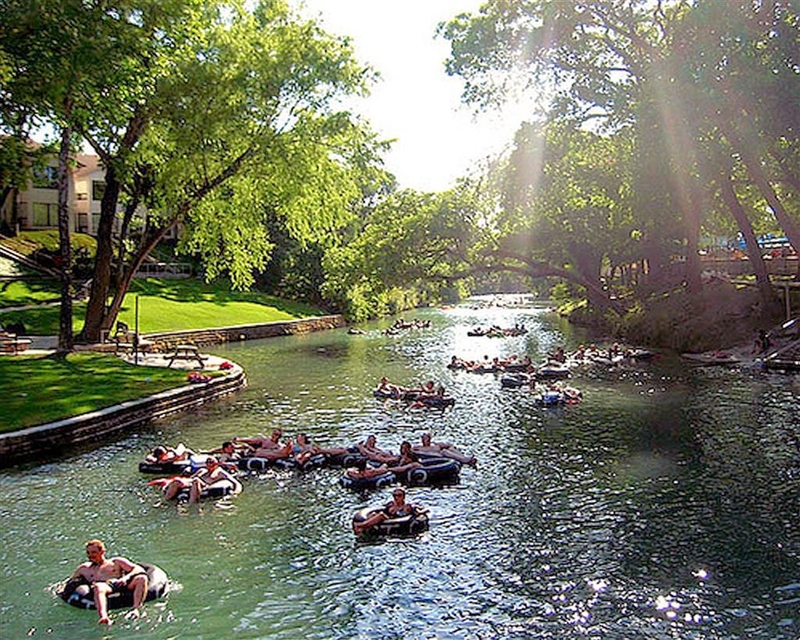 Next day, on the advise of Anne at the hotel, we were able to find a tour company to provide us with tubes to do down the Comal River, 4 channels for rapids. Took 2 hour for the river and a great time. Later went to a historic cotton gin for supper. A two-night stay was highlighted by very courteous and efficient employees. Anne was especially kind. I was grateful that the desk clerk was so helpful when I arrived at 2 am after a long drive. The room was clean and comfortable. Breakfast was fine though cold cereal was mossing. Nice contemporary lobby design. Awesome bathroom amenities. Friendly breakfast attendant (Ann). The exterior could use some upgrades and the breakfast area could be bigger. I didn't see the difference between the executive double and the regular double. 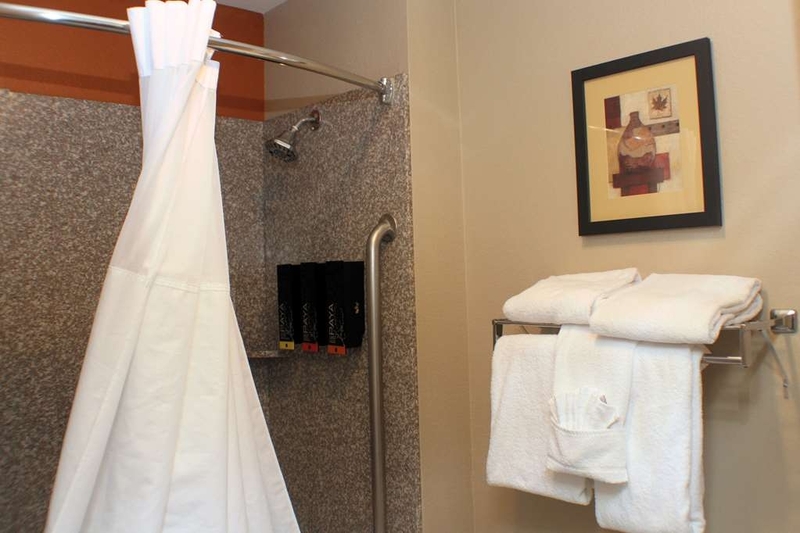 Pleasant staff, clean room, love that they had shampoo, conditioner and shower gel dispensers within the shower itself. Nice breakfast buffet too! Some of the towels could have been replaced as they were worn and dingy but overall really good experience. I called the front desk to have more towels sent up and they came up in about five minutes or so. Really liked the fridge, microwave and iron/ironing board which was totally convenient and useful. Location on I-35 provides easy access to all destinations. I would definitely stay here again. I am pleasantly surprised with our experience at Best Western,Everything was above board. The buffet breakfast buffet was the best yet! Go see Anne,Shes a sweetie.We would definitely stay here again.. I enlisted help from Becky at the front desk to secure a room in another city for a family member. Becky was so kind, patient and very professional. Several parties checked in while I was working out details and Becky offered them the same professional service. Becky certainly is a calling card for Best Western. I will recommend this Inn and Suites to my friends and family for sure. "Worst Experience at a Hotel"
Our hotel room was TERRIBLE. The drain did not work. There was hair ALL over the bathroom. Bed skirts were horribly stained. There were pen marks all over our bench. I stepped on somebody's hair clip that was left on the floor. Floors were not vacuumed at all. "Great place to stay for business or vacation "
I was traveling for business , my wife was with me for a get away. 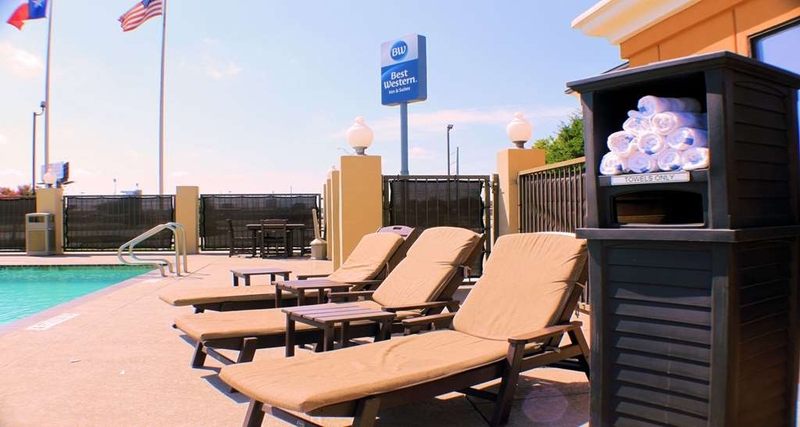 This Best Western is close to downtown New Braunfels , and lots of shopping , there was a variety of restaurants near by. Traffic was not a problem, easy to go touring from here. Not far to Gruene . The staff was very friendly professional . The breakfast is good. We had suite , it was nice,the room was clean. Staff is very nice. Ann is especially attentive and breakfast is great! 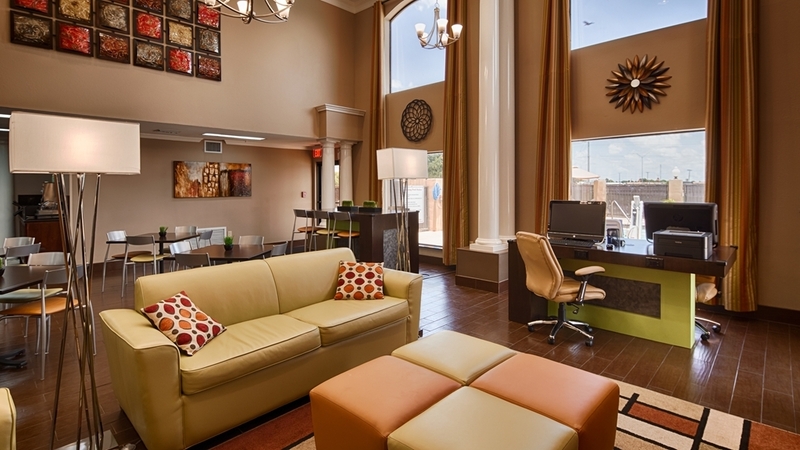 Location on I35 allows for quick access to any local attractions. Standard room looked fairly new, beds were comfortable, I liked the large sized tv and clean remote control. The is an average motel with NYC rates...we were in town for a wedding - we used Expedia and somehow ended up with this "motel" - doors of the room open to the outside - there are a larger number of hotels near this one - quality brands - we made a big mistake and paid a ridiculous amount of money for 2 nights - be aware !! Nice hotel. Staff was friendly, room was clean, hotel was clean and breakfast was fresh. Only "negative" is I was surprised that most of the rooms were outside doors. That usually makes me uncomfortable; however I felt safe here. 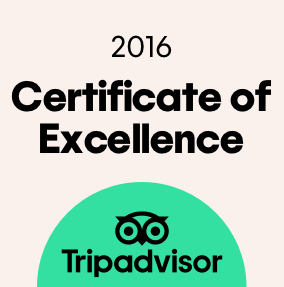 Overall our experience was very good! I would recommend this hotel. I woke with a allergic reaction to mold, this was taken care of by moving my room!!! No problem after that, they are old and need remodeling! Otherwise, the experience was really good food okay, coffee was great available 24/7. Room service was good. The Dancing on my head, children up stairs had a dance mat after 10pm, that was taken care of Immediately!!! All was good, comfortable and great service!!! I'd give it a 4 star! "Very clean hotel, good service, good location"
The hotel/motel was very clean and located at the end of Gruene Rd at I35 which made it very easy to get in and out of. Convenient for going to Gruene or going to Schlitterbahn. The rooms were very clean, the beds were comfortable, the air conditioning worked great and the shower pressure was wonderful. Lots of hot water! We stayed in a king suite. Breakfast was average. I was surprised by the fact that some rooms are outdoor access and not inside the hotel. The manager was kind enough to change our reservation when we arrived to an indoor room. Room was very clean. We spent a week night there and it was packed so be sure to make reservations ahead of time. Breakfast was the typical continental but get there early as the supply was nearly depleted by 8:45. "New Braunfels - Schlitterbahn Trip, average at best"
The hotel itself in this area was a decent value, though I prefer similar options without rooms that open to the exterior/parking lot. The hot breakfast could and should have been better. We've traveled to New Braunfels a number of times now and while I would stay here again, I would consider competitors next door and in the adjoining parking lot as well. Everything was great except the tv/remote did not have a functioning guide to channels. It was showing an analog system and the remote only works in the digital system. Also their price is much higher than normal in the area. Extraordinary area, calm, agreeable bed, fabulous breakfast things. Indoor pook and hot tub. Anteroom loaded with perusing materials and extra large flat screen television and couches. AARP daily rate is an awesome quality. Near downtown and Second Mon Trade Day grounds. Attempt to go see the new extensive BOWIE KNIFE in plain view. When my friends said we were staying at the Best Western for the weekend, I wasn't too thrilled but knew it would do for a shower and place to sleep. This Best Western exceeded my expectations! 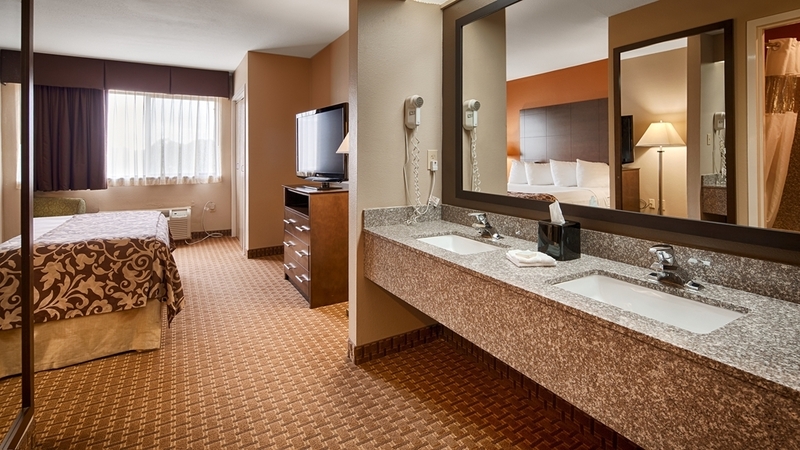 The hotel lobby is updated with a modern look, the rooms spacious, and immaculately clean. Definitely would recommend. The continental breakfast is well, standard, if you like that kind of thing! No gym and issues with our hotel door but for the price, a decent deal, Staff was helpful and nice. Hotel lobby and breakfast was good. The only issue was upon a recent upgrade, there were still some issues with our room but overall experience was good. "Great day when visiting Schlitterbahn"
Best Western staff Becky and Jennifer were amazing. These two ladies were friendly and very helpfu. l have found my lodging for every visit. Breakfast was great. They have many meal options. The sugar free syrup was just what my diet needed. The rooms were very clean and comfable. Kid friendly. This hotel served its purpose, good price, clean and friendly staff. It's certainly no 5 star hotel but, it was good as a overnight stay. Wasn't too busy, and we actually got to park in front of the room so that was a plus. Schlitterbahn is about a 10 minute drive, that was the reason we stayed in this hotel in the first place. "Poor Management Care and Concern"
Manager not willing to cancel reservation and work with customer. Could have been more accommodating to a customer issue that was beyond our control.Unfortunately put money in the way of good customer service. Nice, Clean, Large rooms. The bath has a soap, and shampoo dispenser. The AC is so cold that you need to run it in the red. The breakfast is a nice plus, with the fresh fruit, bagels and of course the waffles. I Will come back. 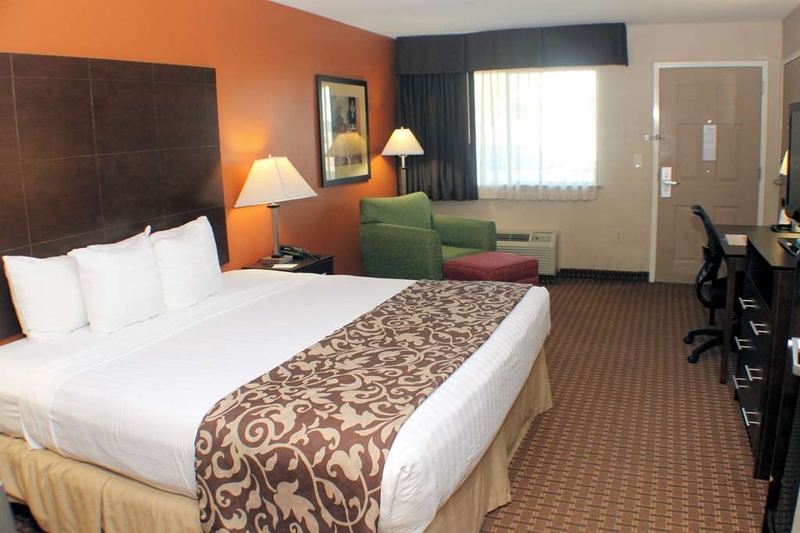 Lodging is off I-10, advantageous to different eateries, different inns, and service stations. Perfect area to get a decent evenings rest before heading focuses west, north, south, or east. Try not to give this inn a chance to cruise you by. We come to this location once a month for a business trip. The service is great! 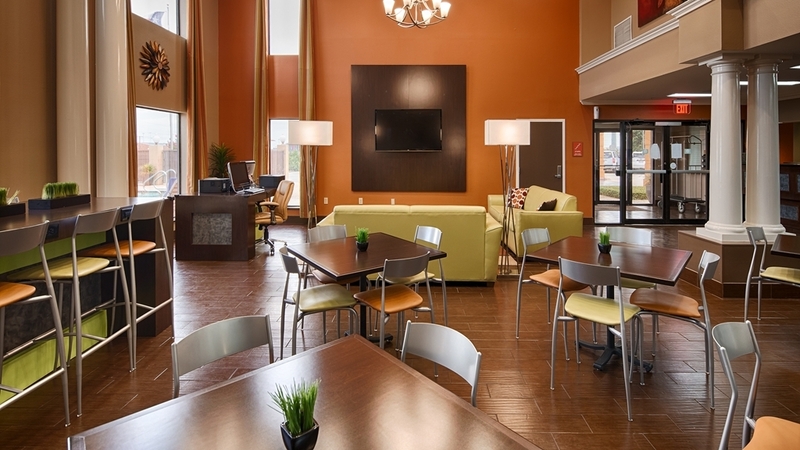 Easy access to shopping, food, and entertainment. Friendly staff and clean rooms. We will be returning to this location! "Don't let the price fool you....it's an awesome place..."
Highly recommend. Price is great...clean...accommodating....updated. I have no complaints whatsoever. I meant to get the woman's name who runs the breakfast but forgot to do that....she def deserves a shout out....plan to stay there again! "Nice stay for Texas State University graduation"
We stayed there for the weekend for our daughter's graduation from Texas State University. Nice place to stay, clean rooms, friendly staff. Lounge area was a little small during breakfast for the number of guests. The staff made a special effort to suit our substantial family gets together. They were there when you required them, however else, I had an inclination that I was in my home. Agreeable and clean rooms, shady from the patio and a back deck with amazing perspectives of the nightfall. Greatest few days of my life! "OK for a cheaper nights stay"
We stayed in mid May for a weekend getaway with 2 moms and 2 teen daughters. I had booked online then had called as I seen price had dropped. I was given the cheaper price which I appreciated. So we got a good deal. I had requested indoor room in special instructions. When we arrived, I asked if it was an indoor room. She said that they were out of those rooms but they had a suite that we would have to pay more for. We agreed because we wanted to be safe with having the girls with us. We were right down the hall on right, room 106. We were surprised that they called this a suite! It looked like a smaller hotel room!! Oh well we were just going to sleep there! When we checked out we were not charged the extra and appreciated that! We heard people in the pool but never went out there as we were in and out enjoying New Braunfels and Gruene. Breakfast was a little better than average Staff was friendly! . We parked right in front with plenty of parking each night, in well lit area that was nice! I assume others parked on side near the hotel rooms. I did notice the stair door is right when you walk in lobby to the right since there is no elevator for 2nd floor. Nothing bad to really say about this place but I proably would try another place another time. "The friendly hotel in New Braunsfels, Texas"
I work weekends and like a hotel that is close to my work, and close to other amenities. This hotel satisfied that. The staff was very friendly and helpful, and especially Anne, who prepared the breakfast. She was very cordial and informative. The hotel was clean, the beds were comfortable, the breakfast was very good, and we could relax here. I will come back. 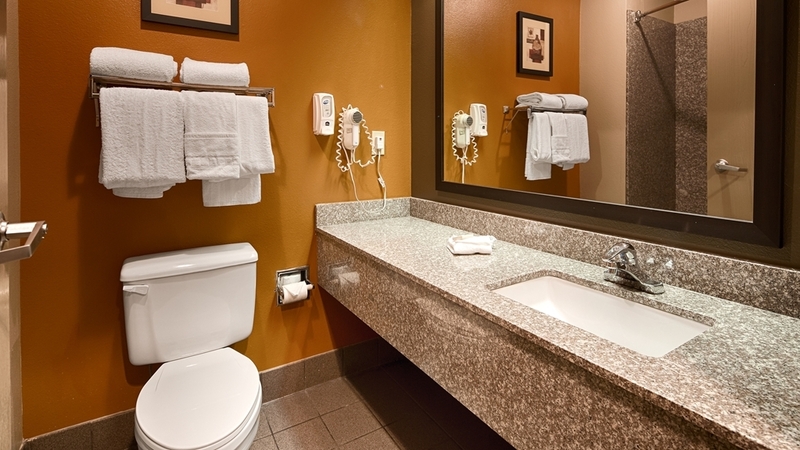 Overall the hotel is clean and the staff is very helpful and friendly. The rooms are "tired", construction is old and drafty, and the beds were awful. I would not recommend this hotel at this location and I usually like BW! This location is good for an overnight stay. I would not recommend this location for more than 1 night. There is not an exercise room, lodging is adequate to get sleep, shower and on to the next destination of the road trip! We were travelling with senior citizens and wanted to make sure that our accomodations met their needs. We were travelling from out of state and knew nothing about the area. We were pleasantly surprised! Comfy beds, awesome shower, delicious and generous free breakfast! Everyone on the staff was very friendly, helpful and attentive. This place was perfect. I highly recommend it. "Our stay at NB BW"
The hotel is very clean and the beds are comfortable, but it is a motel, not hotel, and the room door opens out to the parking lot. It grossed me out, and did not feel safe, although nothing bad happened. Sorry excuse for suite. Booked a suite online, but when I arrived it was a regular two bed room. I informed about booking a suite. They upgraded to an executive double room. And that was, according to manager (nice lady), their biggest room. Actually, it was a tiny bit bigger with queen beds. 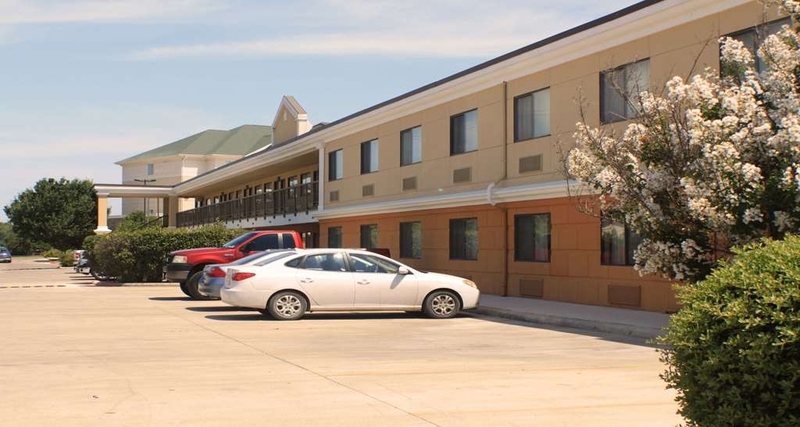 "Comfortable, Friendly and Convenient Hotel"
The Best Western Inn & Suites was convenient to I-35, local restaurants, and other venues. The hotel staff was friendly and offered restaurant advice (which was spot on!). The suite we booked was spotless and comfortable - very quiet and breakfast was had many options, hot or cold choices and great coffee. Will stay here again if staying in New Braunfels. everything was great, room was clean an in good working order. good location, great staff, no problems what so ever. Loved it. breakfast was good, nice pool, it was quiet, slept well, would stay there again for business or pleasure. "Very nice stay in new braunsfels"
This hotel is at a good location and was very relaxing. My husband and I enjoyed the hotel. The breakfast hostess even suggested a nice German restaurant that was good. 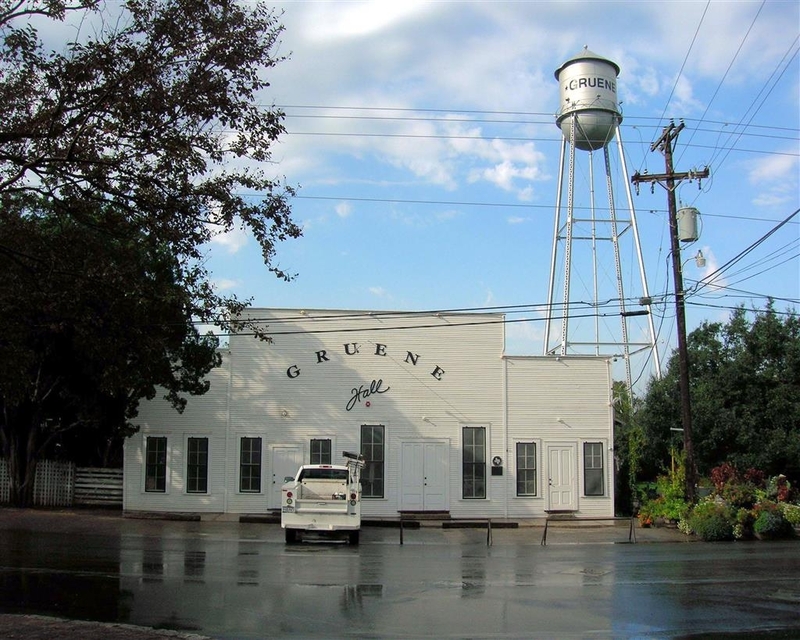 It is nearby to several places to eat and near Gruene. I think we got a good value. We stayed upstairs in the back. They also have inside rooms. We did not have to go far outside to get to the breakfast room. You could walk inside to get there. There is not an elevator, so if you do not want to climb stairs, request a downstairs room. 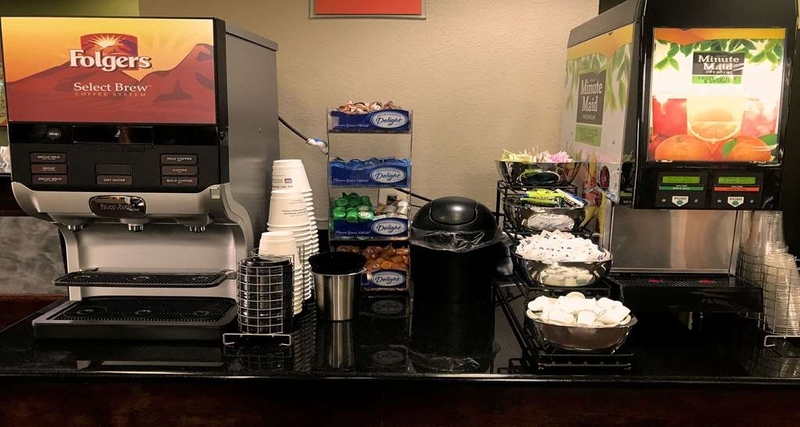 "Best Western New Braunfels Excellent Stay"
Best Value for a comfortable, quality service and setting convenient to everything from San Antonio to Austin. Quiet, beautifully appointed rooms. Excellent breakfast. Service staff is warm and friendly. What more could you ask for? "Close to Interstate and All Attractions"
The room was priced well, it was attractive, clean, and easily accessible to parking. Great breakfast and friendly, helpful staff. LaQuinta has been my first choice for a while, but Best Western may move to the top if this stay is any example. "Lovely Property Excellent Staff -- Can't believe the pricing compared to the other hotels"
Peaceful, quiet, beautifully appointed rooms. Great breakfast with wonderful, friendly hostess. There isn't another hotel we would ever consider doing business with when we come to New Braunfels! This is IT! we have used this best western hotel before. the location is extremely easy to reach and leave. they are priced a little high for multiple night stays, but not to bad for one. breakfast was very good and we were well taken care of. 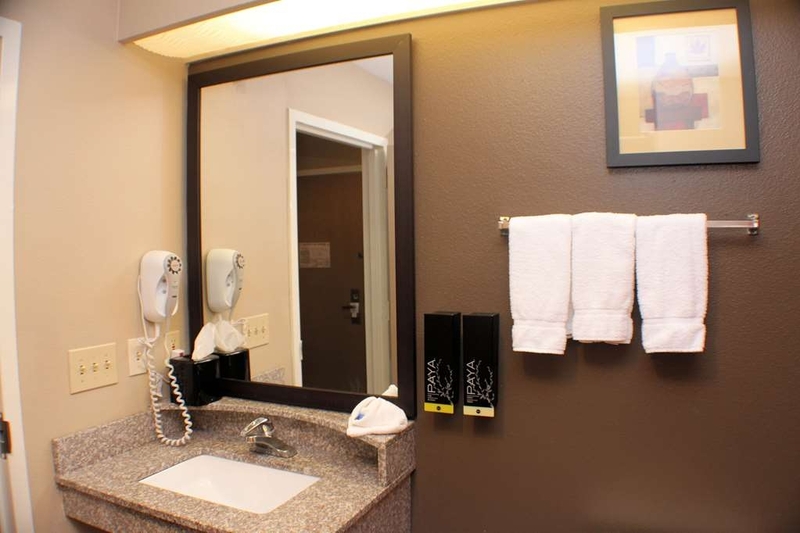 "BW Inn and Suites in New Braunfels"
Reasonably priced motel in a convenient location for visiting San Marcos, Schillterbahn, and San Antonio. Staff was very friendly and helpful. Prices a bit lower than similar BW motels in the San Antonio area. Best Westerns are one of the hotel chains that are always on point it comes to providing great value, and this location was no different. Clean rooms, great pleasant staff, new and modern, QUIET, and just overall had a great vibe. Great for families, business people, EVERYONE! "Clean and felt like new!!" Beautiful hotel in a great area! Wonderful breakfast and very caring and helpful staff. Especially the front desk manager and the morning breakfast woman!! They both went out of their way to keep everyone happy and content with their stay! The room was beautiful and clean and the bed was comfortable! The last couple of times I've stayed at a Best Western they were nicer than expected. Very clean almost as if they had been recently remodeled. Easy to get to, right off the highway and fairly close to all the local sites and restaurants. For a place to stay I would definitely go back! The staff there is the BEST! Everyone is very helpful and welcoming as soon as you walk in. The breakfast was good as well. I would like a bigger variety of meats for breakfast but other than that it was great! "The property is dated but the breakfast service is not"
The hotel was really nice and clean, the staff was accommodating and very friendly, the "Breakfast Lady" is a Hoot and keeps ya smiling in the morning -nice breakfast (free) and plentiful-highly recommend the same. Ask the "Breakfast Lady about her dogs-you will enjoy the conversation and she will advise ya of places to go locally. We loved our comfortable, quiet room! The breakfast hosts are outstanding and kept up with the crowd! There are rooms with inside entry and others that open right to the parking lot, so if interior doors are important to you, be sure and ask when booking. The motel is right off the highway. Drive the river road while in the area---beautiful! Professional and courteous staff. Superb breakfast. 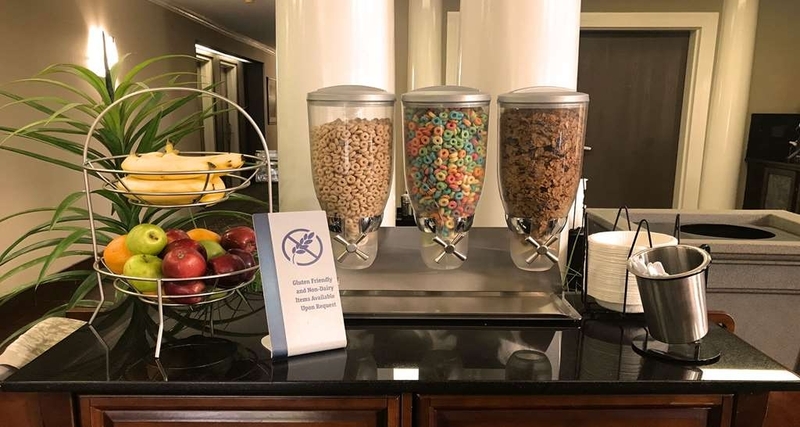 Probably the best breakfast offered in any hotel. Lots of variety. My kids loved the breakfast and actually complimented it as being the best by far served in any hotel we have stayed at. I definitely got my money's worth. Hotel was nice and clean. Front desk staff were friendly and helpful, especially Anne. We missed the continental breakfast due to the daylight saving time change and she brought out some muffins for us to nibble on. She and the front desk staff gave excellent directions to places around town. This is a "thumbs up" hotel. Access from the freeway was a little difficult, but the room was very good and people extremely helpful. Very courteous and helpful server at breakfast which was also good. We paid extra for the jacuzzi - it was ok but not really very large. Clean and efficient hotel. I would recommend it to others. Anne was a wonderful attendant. She helped me every morning while I fed my daughter. Shhe would prepare me a breakfast and wash my baby dish. She recommended activities and dining. She had a lovely disposition. "hotel not bad - could use a door for the bathroom"
Overall the hotel was nice. The hotel was clean and comfortable and the breakfast was totally fine. However, I think we just happened to have the worse room in the house. A king suite, with a bathroom door that couldn't clear the toilet so that it couldn't close. The hotel did offer us another room, but we had already unpacked and didn't want to deal with it. The room was $150 a night- really? Never seen anything like it. We stayed one week at the New Braunfels, Texas Best Western and it was an absolute delight! What made the accommodations so wonderful, was the hostess working while we were there, Anne. She made us feel like we were honorary guests at her own home, taking responsibility for our comfort in the Inn and enjoyment of the city. She was knowledgeable about surrounding shopping, dining and entertainment, giving helpful advice that made our stay in the city a very fun vacation! "A good deal provided some affordable luxury"
I've done a fair of roadtrips through N.America (20+) and Best Western is almost always a bit above my budget target; but this time a I got an excellent deal and went for it. I was not disappointed, a bit more classy than most. The room was nice, a bath, coffee perculator and breakfast had a very friendly lady in attendance who kept things tidy and took well good care of us. Hopefully I end with more of such deals. We enjoyed our stay at Best Western. There was, however, a problem with the bathroom sink, the stopper would not come up after you applied the stopper stem. The front desk was quick to aid assistance. We enjoyed the continental breakfast especially with Anne Phillips who took care oversee facilitating the breakfast. Anne was a great help in that she aided us in getting to know the city of New Braunfels. We enjoyed our time with her. The hotel is old and area around was unkept. Hard pillows, no hand lotions, room not clean. Flickering floor lamp-had to unplug. Anne the breakfast lady was very friendly and helpful. She even made fresh eggs for us. Front lobby was nice. Moving cross country stopped in at The Best Western. I could not sleep and Jennifer was so nice she helped me chill out so I can fall asleep. Love this place!! Totally changed me opinion about the quality of the hotel!!! The location was very close to Gruene, TX and to downtown New Braunsfels, TX. This was the best point about the hotel. There are a set of rooms that have the front door that goes outside and a set of rooms that have the front door that goes inside a hallway. "We enjoyed our one week visit with the Best Western in New Braunfels, T.x"
My wife and I were visiting friends and stayed in room 101. The staff were accommodating and frìendly. Our breakfasts were especially enjoyable. We met a lovely lady named Anne, who was a wonderful hostess. She saw to our every need, while having breakfast and answered many questions about the area and gave names of the restaurants in the area. The front desk staff, all of them, we're pleasant, smiling, and helpful. I'm telling everyone about this place. We intend to return! The best Best Western I've stayed in for a long time.
" Not posh but decent price and good breakfast and friendly staff"
The room smelled a little musty since the room opens to the outside like a motel. The setup makes it easier to unload from the car though. It got better after the air was going for a bit just like at other motel like places I've stayed. The bathroom had nice granite but there were dispensers on the wall for shampoo and such. This seemed much more cost effective than the little bottles, however, the shampoo dispenser in our room was empty so I had to wash my hair with body soap so that was a little irritating. I usually bring my own but was trying to save suitcase space since we had more than enough to lug around for the holidays. Since there were very few guests when we were there, the lady in charge of breakfast (Anne) asked us what we wanted and then went and the back and prepared everything - eggs, sausage, poured us juice, even cooked our waffles for us. She was very nice and attentive. I've never been waited on at a Best Western :) she was quite enthusiastic and helpful. Overall I would probably stay again for the price but I would definitely double check the soap dispensers earlier next time. "More like a motel building"
Very disappointed to turn up and find that this hotel's standard rooms are all with outside doors. We were offered an inside room for an upgrade of $20 - no thanks. So we drove around the side to park our car right outside our door which is not a benefit seeing we will hear every other car that arrives and departs. We were asked to sign a document at the front desk promising not to smoke in the room, however, as we checked into our room there were a few people outside a room two doors down that were tailgaiting right outside their room, BBQ grill and all. So much for the non smoking policy, all the smoke from their BBQ came into our room. Who knew you could bring your own cooking facility to a hotel? Rooms was clean and updated so no complaints there. Up to you whether you're OK with an outside room but we'd surely not stay here again. Room 121 was enviting with every amenity . Jennifer our delightful hostess makes delicious Texas waffles ; eggs sausage coffee were hot fresh and very much enjoyed thank you Jenifer! 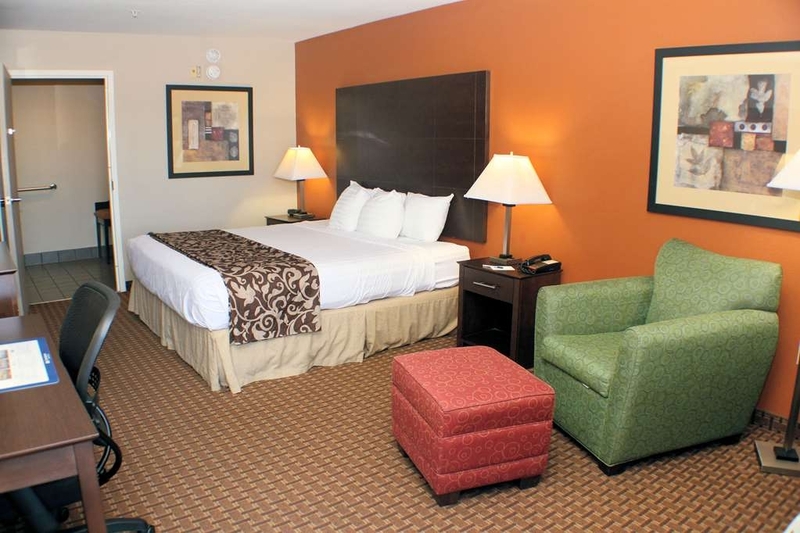 We are so glad we chose this Best Western with our smoke free room for a good nights rest the night before Christmas eve! "Avoid New Braunsfels Best Western"
Hotel has safety concerns. Exterior door lock has hardware removed, Robbers can enter hallway and access peoples rooms. Our deadbolt did not work also, reported these items to the desk clerk and was blown off. To be secure in the room at night I moved a piece of furniture in front of the door so no one coule kick the door in at night. I will never stay here again. Hi, I recommend this hotel, I was here five years ago with my family. The place is very nice compared to my last stay. The staff is very friendly. And on my next trip back to this hotel. In general all service is excellent. "Friendly staff, lovely room, great amenities at Best Western Inn & Suites"
I was traveling home from a business trip late last night when I got caught in a storm and decided to be safe and check into a motel. Boy am I glad I did! This is a fantastic motel. It may not be the 4 Seasons, but its a fairly luxurious motel--clean, comfortable, wonderful amenities (do yourself a favor and check out the breakfast buffet), and best of all, the staff hospitality is out of this world. In particular, the manager/owner (?) Mike is very helpful, as is Jennifer, one of the staff members who greeted me early this morning with a friendly smile and went out of her way to help me w/ answering questions, getting me a tray, and/or other small items I unexpectedly needed at 7am. I like this place so much, I even extended my stay. Well worth it! "Nice front office, not so nice room. " We were given room 223 on the back, the room was ok, but there was no soap for face or hands, the dispenser was empty. I went to the front desk to ask for soap. The chair by the desk had some really nasty stains, I was afraid to sit on it with out a towel. The I woke up with a really bad headache and my nose running as if there was something on the room making me sick. We left for the day and I started to feel better. When we got home that evening the housekeeper had been there and there was not a single soap, hand towel or wash towel. Not sure if they are short staff or what but the room was not as clean as I normally experience at a best western. Again the next morning I woke up with a bad headache and dizzy. We left the hotel as quickly as we could. I think they need to clean that room from end to end and wash the rug. 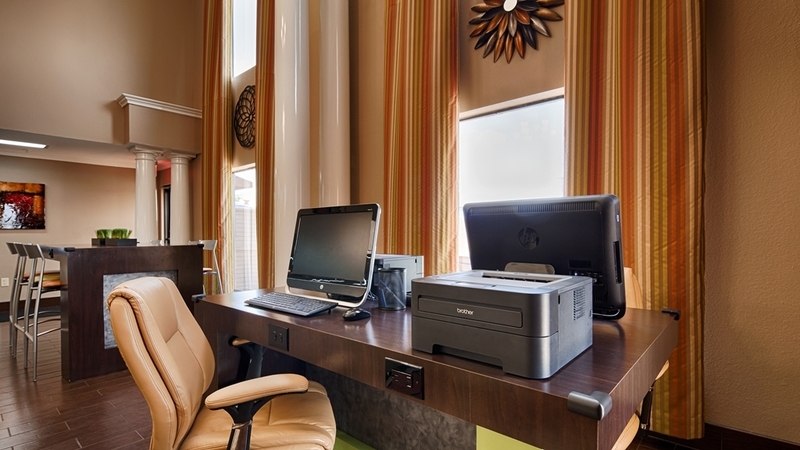 "Friendly folks work there and the hotel was very good and in a good location." Wifi worked pretty good it wasn't perfect but good enough. The air conditioner and tv worked well. As far as the amenities, first time I have encountered shampoo, conditioner and soap dispensers in the shower. Looked like they worked good, not sure if it will work long term though. Good experience not great but very good. Good breakfast! "Best Western - Nw Braunfels"
The experience at this hotel was excellent as we have generally found at all Best Westerns. It is our favorite hotel chain! !We plan to continue going to Best Western. I would recommend this hotel to anyone. "New Braunfels TX Best Western"
The staff was very friendly and gave good directions for local places to eat. The bed was comfortable, the room clean, the internet fast, the hot breakfast tasty. This was a very good value for the price. What you expect from a Best Western, except the pillows are very small and hard, and the bathroom sinks are at a height for small children. This was a nuisance and the pillows made getting to sleep very difficult. The staff was friendly and the hotel looked nice overall but found roaches in my room which was disgusting. Breakfast offered is great too. Everyone was really nice and has a great attitude. Did not report the problem as it was my last night and was extremely tired to be moving all my things to another room but found the roaches that second/last night and the morning of checkout found one on the bed. Will never stay at this location again. "Great Place to stay near Austin"
The entire hotel staff did everything possible to make my stay comfortable and event free. Jennifer made sure my reservations were correct and even went out of the way to make sure I had fresh coffee and other items at 5 AM. 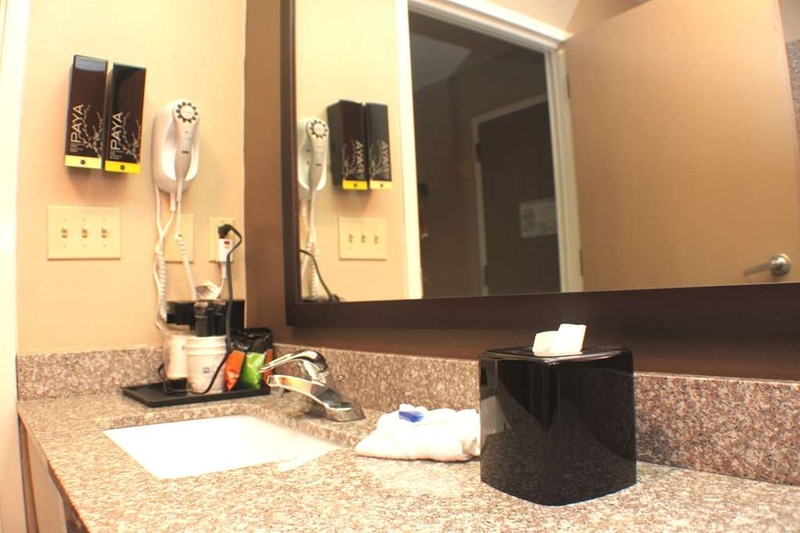 The price is more then fair for this area and the hotel is well lit and very clean. Plenty of restaurants and places to shop nearby. 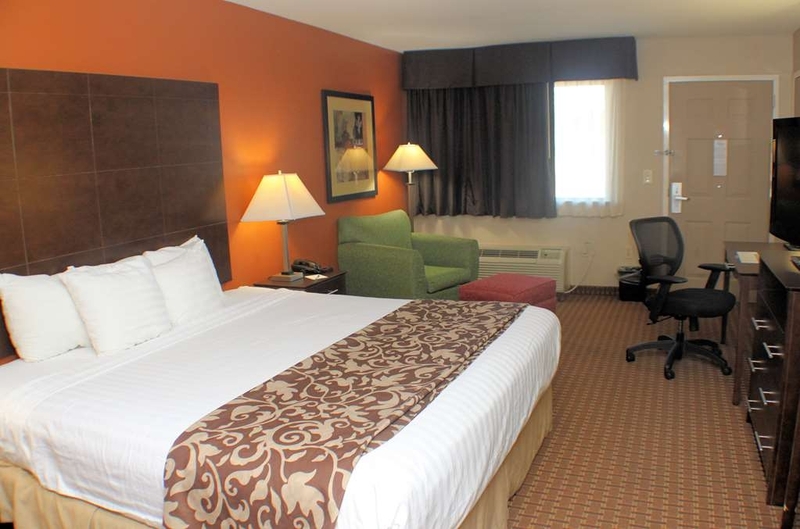 This was my fourth stay at this Best Western and each stay was a good experience. The staff is super friendly and there is always fresh coffee available in the lobby. (BW has really good coffee.) The rooms are clean, the beds comfortable, wifi works well in all areas. Stayed here on 2 separate occasions and enjoyed both. Rooms are spacious, modern and clean. Breakfast was adequate. Besides not being able to get the wifi to work on my iPad (even tho it worked great for my other devices) and the washer not working in the laundry room ( jammed coin slot) this place was great. 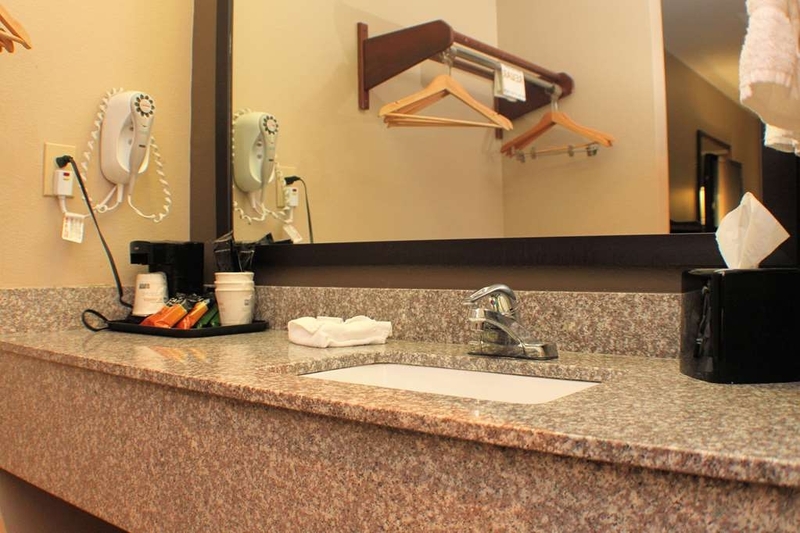 "Thanks Anne of the Best Western Inn & Suites of New Branunfels!" My family and I had a wonderful stay at the BW of NB. We arived Friday, October 23, 2015, stayed in room #124 and it was lovely. The room was beautiful and clean and very warm. My Daughter and myself went to breakfast Saturday morning and Ms. Anne took great care of us. Thank you again for a great visit. Sharlese is a most pleasant and very helpful person. She went way above and beyond to help me get to the hotel. There was a major accident and the freeway and access roads were shut down and I could see the hotel but could not get there. The room was quiet and comfortable. The staff and service (Anne) was exceptionally helpful and friendly. The breakfast was very good. It is a very busy time of year here in New Braunfels and luckily we had made a reservation. A storm hit the area, but we slept soundly. The accommodations and TV were excellent. We will definitely will come again. "Truely the 'Heart of Texas''!" What a wonderful visit! We were allowed to see a room before we secured it, the manager was very willing to show it to us. The room was large and roomy, quiet, comfortable bed, all was as advertised. 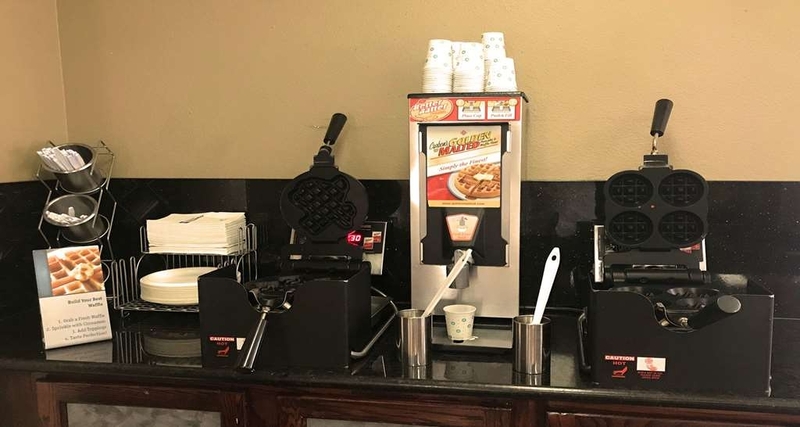 We were visiting family in the area and it was a great central location just off Interstate 35, at exit 189 S. The manager and front desk clerks were very friendly and polite, Annie, the lady taking care of breakfast, extremely nice and friendly, made us feel like family. Breakfast was good and consistent every morning. Their were 2 TVs in the room, and even though they were under going a change from Analog to Digital, we had no problems at all. The internet a little slow, plugged into outlet and worked great! Probably part of change in cables. We will absolutely stay again if we are in this area! It is close to many family activities, outlet malls, great restuarants, everything good, nothing bad. We were 2 nd floor and there is no elevator, but not a bad climb and very quiet! Loved the people and the hotel! We were at this location for two nights and had a great experience while we were away from home. The room was not only clean, but also quiet as we were near the lobby area. My family enjoyed the variety of breakfast options offered. Room was quite nice. Comfortable and clean. Staff was excellent, especially Anne who worked in the lobby setting out breakfast items and making recommendations for nearby places to visit during our visit. Every hotel/motel should have someone like an working for them! "Safe in the heart of Texas"
We arrived with no reservations were allowed to see a room before we booked it, made to feel welcome and the check-in went very smoothly! The manager took care of us, ( 2 couples, 2 rooms), was extremely nice and helpful. We had great breakfasts every day, a really nice lady ( the breakfast lady), Annie was so great at helping us, had a way of starting our day off with smiles, and directions, etc. stayed 4 days and will definitely go there if ever back in the area! ( Texas is a BIG place! ) feel very fortunate that we found such a nice, clean, comfortable, safe place! Thank you! The motel sits just off interstate 35, need to get off at exit 89 going south, frontage road only runs one way to south. You do hear the traffic, if outside by the pool....did not bother us. Many activities in this area for families and kids, also large flea markets and Artisian shows ( wood carvers in Gruene) many old shops were full of history, good places to eat.....fast food or restaurants family friendly prices. I gave a 4 rating on service because of one maid, who did not do a good job! The management was going to take care of that the day we left as it only happened the day before, other wise we couldn't have been happier! Very quiet, clean, comfortable! There were some problems with the Internet, was slow. They were changing all their TVs to digital and I think may have made the problem??? I did find that if I plugged my iPad into an outlet the internet worked much better! Trouble with TV working (2 days to fix), room left unlocked, housekeeping not leaving wash cloths or cleaning bathroom, internet issues. Front desk staff were good. Breakfast was okay but eggs cooled off too fast. "A great representative of Best Western." Friendly and informative staff. Easily accessible and affordable. If you get to meet Anne during your stay you will be delighted. Lovely woman. It had been a long day and many miles on the road check in was quick and painless. During this 14 day road trip this hotel was a definite winner. My only regret was that we only stayed one night in this hotel. We were away for 2 weeks and most of the places we stayed were nice, some better than others. But if every night would have been in this hotel, it would have been more enjoyable. The breakfast was very good and the lady who prepared and managed it was very hospitable. 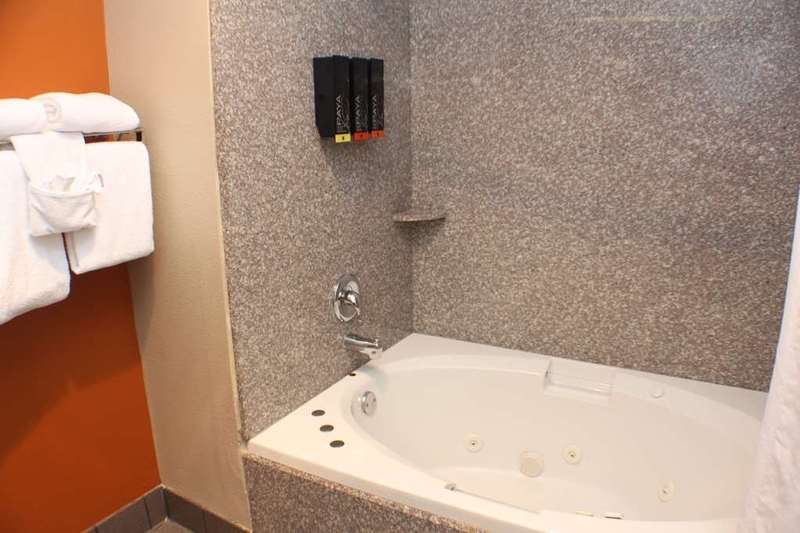 "Delightful Stay at Best Western, New Braunfels"
Extremely nice personnel and nice size and equipped rooms. Check in desk clerk was very informative and the lady in charge of breakfast was a delight to talk to and also very helpful about the area. Her bright smile and personality would make anyone smile. What a pleasant start to the day. Very good experience. Offered me early check-in since we reached early. Good breakfast. Very good internet service and Clean room. Perfect location to check out other things in new braunfels. Good restaurants near by. We found the hotel clean and comfortable. The breakfast was plentiful. The staff was friendly and helpful, advising of good places to eat and spend the day. 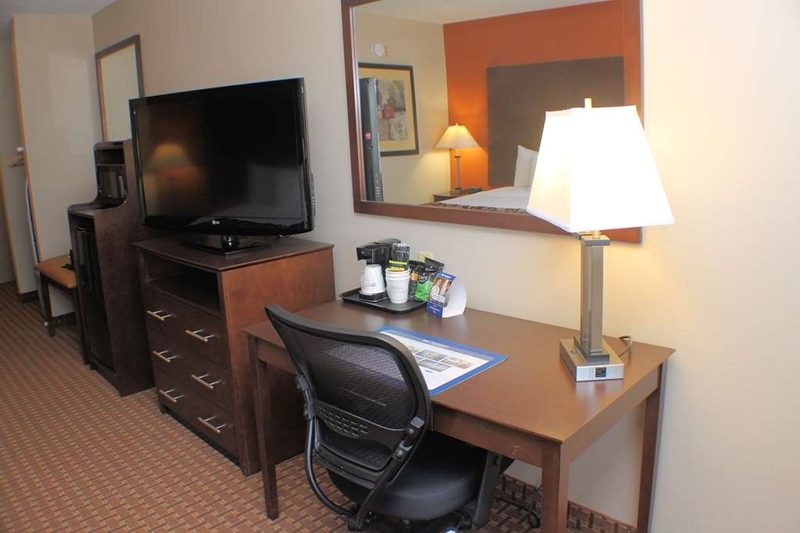 Hotel is located conveniently to river and shopping. Clean, quiet comfortable room. We had a restful stay. Great restaurants and a stroll in Landa Park also added to the day Breakfast at the hotel was great-Texas shaped waffles DELICIOUS!! We are already planning a return stay in December. "Clean, Comfortable, and Pleasant stay"
Our first time to Texas, and was pleasantly surprised at the area. Convenient to the interstate highway, and there were many eating establishments in the area. The room was nice, Relaxed in the pool and hot tub when we had the chance, and had a pleasurable experience here. We will stay here next time in New Braunfells.